Read it from the beginning. If you haven’t the time immediately, look at the illustrations and turn to the map at the back to find the numbers of the stops along the route you are travelling. Then turn to the roadlogs (starting on page 71) and follow each stop carefully, for you will find that the beauty of the scene is increased for the traveller who knows something of what he is looking at and how it originated. 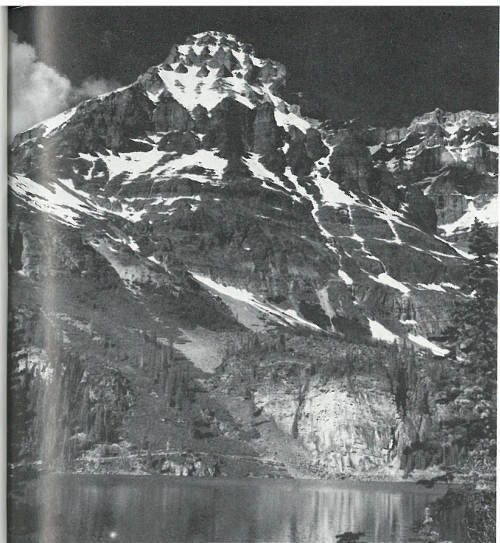 The first part of the guidebook describes in some detail the general aspects of the geology of Yoho National Park . . . where it is, how the mountains there originated, what the rocks of the region are and where they came from, and the different shapes of mountains related to the structures of the rocks composing them. This general background is followed by detailed descriptions of selected localities of special geological interest. The last part comprises a series of notes on what is to be seen at each of the lookouts and roadside stops along the main travel routes, with an index map to show where they are. Most of the words used in a technical sense or which have an unusual meaning are explained carefully where they are first used. But if you don’t immediately find the meaning of a word look in the index, for many of the unusual ones are listed there along with all localities and subjects. All photographs are by the author. Line drawings are by D. L. Dineley, University of Ottawa. Twin Falls—branching meltwater streams from Glacier des Poilus form these double plumes that cascade over a great cliff in the northern end of Yoho Valley. YOHO NATIONAL PARK is 507 square miles of magnificent scenery on the west slope of the Canadian Rockies. The surface of the land presents an extremely rough and varied scenic picture. Mountains of many different shapes and sizes stand high above deeply incised valleys. The mountains are sculptured from great up-arched or up-bowed masses of rock which formed from sediments laid down in the seas that covered the area some 500 million years ago, in a period of time which the geologist refers to as ‘the Cambrian’. In some places the rocks are lying flat, even in the highest mountains; in others they are standing on edge. Deep etching of this irregular mass has resulted in a great array of mountain types—from those with sharp jagged peaks to those resembling castles or layer cakes. The sides of the mountains, extending as they do through thousands of feet vertically, expose many varieties of sedimentary rocks. And some of these contain beautifully preserved fossils, the remains of living things of long ago. In the southern end of the park a number of mineral deposits are contained in a small mass of igneous rocks and other rocks which have been changed completely from their original appearance, and these deposits make Yoho unique among western Canadian National Parks. Thus, for the traveller who has time to look, Yoho National Park has, in addition to magnificent scenery, many features of geological interest in the rocks into which the scenery is carved. In this book we will talk about the beauty of the scenery, and how it was made from the time the rocks were formed to the present day. But first let’s examine the boundaries of the park to see exactly where it is. Because many of the park boundaries are divides, we should find out what divides really are. Any stream, even the largest river, gradually gets smaller above the tributaries that pour water into it from the sides. Thus, even the largest rivers rise in a multitude of very small streams which make up the bulk of the main river by uniting their waters. If we travel farther and farther up a small stream we will eventually come to where it begins as a tiny trickle of water. Such a place is usually near the top of a hill, for as rain falls on the hill it will naturally flow down the slopes on all sides. Thus the crest of a ridge forms a natural divide between waters that flow down one side and waters that flow down the other. This is why, on the ground or on a map, a line drawn to separate two drainage systems is called ‘a divide’. A look at a map of the whole of North America will quickly show us that some very large rivers flow into each of the oceans bordering this continent. If we were to follow these rivers to their very headwaters we should find a line separating the drainage to the Pacific Ocean from the drainage to the Atlantic Ocean, and other lines which divide Atlantic drainage from Arctic drainage and Arctic drainage from Pacific drainage. Thus we apply the term ‘continental divide’ to the imaginary line that separates the drainage of a continent. Ever since man first began to separate territories it has been convenient to divide them on the basis of drainage basins of rivers. Boundaries of countries, provinces or even counties have commonly been defined as the divide between the water flowing to one side and water flowing to another. One such boundary is between the Province of Alberta and the Province of British Columbia. This divide, which runs right up the spine of the Rocky Mountains, separates waters that eventually end up in the rivers to the Pacific Ocean from those that will flow finally into the Atlantic Ocean. It is this same continental divide that forms the eastern boundary of Yoho National Park. This means that at the East Gate or at any other point on the continental divide, a cup of tea spilled half on one side of the line and half on the other would eventually reach different oceans. In fact there is one spot in North America where drainage is split among three oceans, and from this spot—in the icefields where Banff and Jasper National Parks come together—your cup of tea could be spilled into the Arctic Ocean, the Atlantic Ocean, and the Pacific Ocean. The Seven Sisters Falls is an unusual feature at the east end of Lake O’Hara. 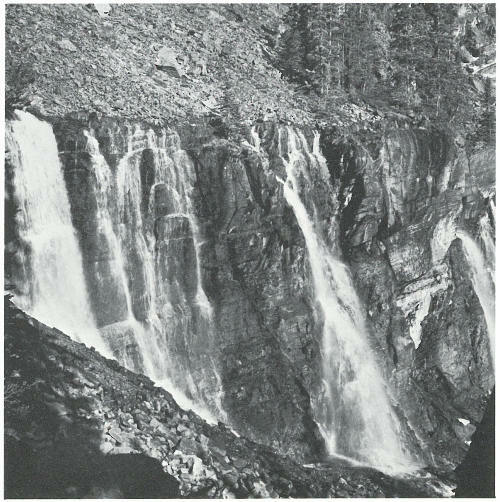 Water issues in large quantities from the base of the rubble slope in the upper left corner of the picture and falls over the ready-made cliff in a set of picturesque cascades. Water at the right margin of the picture has worked its way down into cracks and fissures and issues from the solid rock itself. Yoho National Park is essentially the drainage basin of the upper Kicking Horse River and its tributaries. The park lies wholly within the Province of British Columbia. Kootenay National Park, also in British Columbia, adjoins it on the south; and Banff National Park, in Alberta, adjoins it on the east. Hamber Park—a British Columbia provincial park—forms part of its western boundary. Most of the boundaries of Yoho National Park are divides. Its eastern boundary, as we have seen above, is the great continental divide. From the northernmost point in the park—on the peak of Mount Rhondda at an elevation of 10,025 feet—a straight-line artificial boundary extends southwest to Ayeshal Peak. The western boundary of the park now follows the divide that separates the drainage system of the uppermost Kicking Horse River and its tributaries from rivers flowing into Columbia River or into Kicking Horse River below the park boundary. At the West Gate the boundary is part of a short, straight, surveyed line from the dividing ridge south to Kicking Horse River. Southwest from this point the boundary follows the main Kicking Horse River to the big bend below Wapta Falls; then it turns east to Beaverfoot River and follows this river southerly and easterly into the valley of Ice River. Another short surveyed line from Ice River to the peak of nearby Mount Mollison brings the boundary once again to a divide. It follows this divide northerly to the vicinity of Mount Sharp, from where it sweeps in a surveyed, curving line back to the continental divide. Thus Yoho National Park includes almost all of the drainage area of Kicking Horse River above Wapta Falls. The surface of the earth has mountains of many different kinds: some stand as isolated masses whereas others occur in groups clearly related to one another; some tower thousands of feet above their surroundings whereas others (called ‘mountains’ by the people who live there) may be only a few hundred feet high. The wide variety of mountains points to a wide variety of origins. In some parts of the world great masses of liquid lava and ash pour up from the depths of the earth to accumulate around volcanic vents. These are volcanic mountains. In other places, rivers and streams have cut deeply into high plateau areas over long periods of time to leave rough, mountainous terrain. In still other parts of the world, huge wrinklings in the earth’s crust are made by tremendous compressive forces, in the same way that you can wrinkle the carpet on a floor by pushing against it with your foot. These make folded mountains. Another type of mountain results in places where the earth seems to have split along enormous faults or breaks and one of the sides may be uplifted several thousands of feet. These are fault-block mountains. When, however, we come to the great ranges of mountains—groups of clearly related mountains that extend for hundreds or even thousands of miles over the surface of the earth—we find a much more complicated story. One of the most interesting parts of this story is that the major mountain systems all over the world seem to have the same kind of history, with at least several chapters in common. We call  this type ‘geosynclinal mountains’ and it will help to know something about how they originate, for the mountains in the western Canadian National Parks are of this kind. To begin the story of these mountains we must go back into geological time about 1,000 million years. North America then was very different from the land we know today. Where we now find the Rocky Mountain System from the Arctic Ocean to Mexico, there existed a great flat area which was very close to sea-level. Great forces in the interior of the earth caused the whole area to sink very slowly below sea-level. The rate of this depression was probably only a few inches in a thousand years but it continued over a long period. It meant that the sea eventually flooded the land over hundreds of thousands of square miles from the Arctic Ocean to the Gulf of Mexico. Into this vast shallow inland sea the rivers from the surrounding regions poured their loads of silt and mud, which spread evenly over the bottom. Waves along the shores of these ancient seas eroded the land, added more sediments, and made currents to distribute them over the bottom, far from shore. As the millions of years passed, the accumulation of sedimentary materials—the mud, silt and sand from the rivers and shorelines, and limy precipitates from the sea itself—gradually filled the shallow inland sea. At times, vast areas must have become filled up to near sea-level. But one of the strange things about these great depressions in the earth’s surface is the way they seem to have continued to sink as the load of sedimentary material in their centres increased. By this gradual sinking and an almost equal rate of filling it was possible for thousands and thousands of feet of sand, silt and mud to accumulate, layer upon layer, and all show features of shallow-water origin. The spectacular peaks and valleys of the Rocky Mountains as we know them today are made of rocks which record a story that began more than 600 million years ago. At that time part of western North America began to warp downward to form an elongated trough as in A.
Rivers poured sand, silt and gravel into the lowland area. 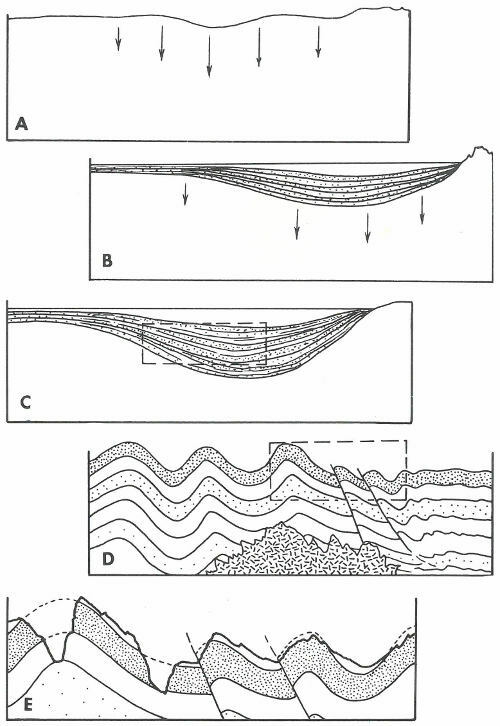 Down-warping continued until the trough was filled with a shallow sea, into which poured a steady stream of sedimentary materials, as in B.
Downsinking continued, but it seems to have been at a rate that corresponded closely to the rate of filling, so that sedimentation was always into shallow marine waters. The mass of sedimentary materials slowly changed to sedimentary rock as the load increased until it had a form like that in C.
For reasons we do not yet understand the trough area was then severely compressed so that the rocks in it were folded and broken. At about this time in the history of such mountains great masses of molten materials commonly appear in the cores of the folded and broken rock, eventually solidifying into granite. D is what an enlarged section of C would look like. Uplift accompanied the folding and faulting, and as soon as the rocks emerged from the sea they were subjected to erosion. Rivers and glaciers carved the valleys and formed the peaks as shown in E, an enlarged part of D. This is the stage of development of our Rocky Mountains now. At a time in the earth’s history which geologists place at between 600 million and 500 million years ago, living things began to populate some parts of the seas fairly thickly. Some of these creatures had hard skeletons or outer coverings, and when they died these hard parts fell to the bottom and were promptly buried by the accumulating muds and silts. In some places the hard parts of the dead animals made clear impressions on the sedimentary materials on the sea bottom. When the soft sedimentary materials hardened into solid rock (over a period of millions of years), the remains of the long-dead organisms became fossils. How do we know these things took place where we now find the western mountains? We read it in the rocks where the story is fairly clearly written. The rocks of which the mountains are made are distinctly of sedimentary origin—that is, they are made of ancient gravels, sands, muds and various sediments that have become hardened into solid rock. They are layered or stratified as we would expect accumulating sediments to be, because from time to time there were changes in the composition of the material being laid down. These changes may have been due to storms, changes in wave patterns, changes in drainage systems, or the changes that would take place as the land supplying the sediment was gradually being eroded away. On some of the rock surfaces we find ripple marks which are exactly like those found today in stream bottoms or in the shallow parts of the sea. By splitting open the rocks we can find the fossilized remains of ancient sea creatures, some of them with modern counterparts. Other fossilized skeletons are from creatures that have been extinct for millions of years; yet we can tell a great deal about them by comparing their structures with those of living creatures and noting carefully their association with creatures we know something about. The kinds of materials the rocks are made of and all the structures found in them can be observed today in different parts of the world in the actual process of formation. We can estimate the extent of the ancient seas by looking for the rocks that were deposited in them. We can tell something of the existence of former shorelines by looking for evidence of beach deposits in the rocks. We can tell whether rocks were laid down as sediments in deep water or in shallow water by comparing what we find in the rocks with what we see being deposited in those environments now. As to the development of the Rocky Mountains we can conclude, by observing evidence of erosion still preserved in the rock record, that the seas withdrew temporarily from the region or that the sediments completely filled the shallow depression on the top of the continent. In short, by putting together and correlating hundreds of small pieces of scattered evidence we can unravel with some certainty the story of the rocks from which the mountains were later carved. The next chapter in the history of the Rocky Mountains seems to have begun about 200 million years ago. The rock record tells us that a disturbance of the very shallow depression on the surface of western North America, which, as  we have observed above, became filled with sedimentary materials, began to change the pattern of development. Some areas of the old trough were lifted up out of the sea and were themselves eroded to supply sediments that were poured back into the remaining sea. As the tens of millions of years passed the crust of the earth apparently became more and more unstable in the region of what we now call the Rocky Mountains. This unrest culminated about 75 million years ago in a complete change. From the Arctic Ocean to the Gulf of Mexico the great thickness of rocks which had been accumulating as sediments on the old sea-bottom in the previous billion years, was lifted above sea-level, broken in many places along great fractures called ‘faults’, and, in some places, strongly compressed. The compression or squeezing caused the great blanket of rocks to fold and buckle, and, in places, to break so that one part slid up over another part. The forces within the earth that would cause this kind of uplift and breaking are so vast that it is difficult to comprehend them at all. Yet we can go to the mountains and once again clearly see proof of this chapter in the development of the Rocky Mountain System. In very old mountain systems of the world, where long-continued erosion has cut into the very core of the mountains themselves, we can often observe in some detail a third chapter in the development of geosynclinal mountains. It seems that during or just after the folding and faulting, great masses of hot molten rock appear in the cores of mountain systems. These push rocks aside or melt their way into the interiors of the belts of folded and broken sedimentary rock, where they cool down and eventually solidify. Canada’s Rocky Mountains have not been deeply enough eroded so we know nothing of this part of their history. Waste from the erosion of the ring of mountains of the President Range pours through the narrow valley in the centre of the picture and spews out in a large alluvial fan. Emerald Lake, which lies in the bottom of the valley just to the left of the picture, is being encroached upon slowly by the spreading detritus. The great mass of the Chancellor Peaks rises above Kicking Horse River below Leanchoil. The silt-laden river deposits part of its load temporarily in its own course where driftwood snags on the muddy shoals. Trees grow on the mountainsides up to a fairly well marked timber-line, but the very steep slopes in the gullies are mostly bare. The next phase in the development of all geosynclinal mountain systems seems to be one of quiet stability, during which the agents of erosion, glaciers, rivers, and wind contrive to cut deeply into the uplifted, complicated mass of broken and folded rocks. For some 70 million years now this has been the history of the Rocky Mountains in Canada. At the present time, as we drive through the river valleys and among the mountain peaks, we can observe erosion as it proceeds. We can actually watch the glaciers pushing and scraping over the country, tearing off rock and grinding it up, some of it as fine as flour. We can see the rivers cutting into their rocky courses, wearing away the land, and carrying their loads of debris towards the ocean. We can observe great masses of gravel, sand and silt—the result of erosion of mighty mountains through tens of thousands of years—now spread out below the foot of the mountains. Erosion has cut valleys deep into the complicated rock structures to reveal much of the story of folding, faulting and uplift. We have already seen how the rocks in Yoho National Park were almost all laid down as sediments in a succession of seas that covered this area in the distant geological past. Now let’s examine these sediments and the rocks that resulted from their consolidation. If we could find a place in the park where a drill could penetrate the entire rock section—from the very youngest rocks on the top to the very oldest ones deep below—we could study the whole history in one place. But because these rocks have been folded and broken along great splits or faults, this is not possible. We can, however, piece together the broken parts of the record from different areas and thus figure out almost exactly what the whole sequence of rocks looked like before it was broken. Within the rock sequence, units of various sizes with different names occur. It is the custom of geologists to give names to rock units; they are named after the place where they were first discovered and described, or after the place where they are best exposed. Where there are masses of layered rocks geologists use different names to indicate the different layers and groups of layers. An individual layer may be called a ‘bed’ or ‘stratum’; thus we might refer to a ‘limestone bed’, a ‘limestone layer’ or a ‘limestone stratum’. A group of such beds, layers, or strata that have some distinctive character in common throughout, is called a ‘formation’. An example in Yoho National Park is the Cathedral Formation—named for its occurrence on Cathedral Mountain and consisting of a number of beds or layers which have a generally similar age, composition, and appearance. A still larger unit of rock layers is termed a ‘group’. Now, having looked at how geologists name rock units, let’s look at some of the rock types and the units into which they are grouped in Yoho National Park. The oldest rocks occur along the eastern edge of the park and in the bases of some of the peaks there. Here, in the  period of time known as ‘the Precambrian’ (more than 500 million years ago), great quantities of sand with occasional muddy layers and silty layers accumulated. These were succeeded at the beginning of the next period in history, the Cambrian, by a vast thickness of limestones and magnesium-rich limestones or dolomites. These rocks were laid down as sediments on the bottom of the sea, in much the same way that limy sediments are accumulating on the banks of the Bahamas at the present time. Hundreds and even thousands of feet of this kind of material accumulated, interspersed with occasional layers of mud and silt. 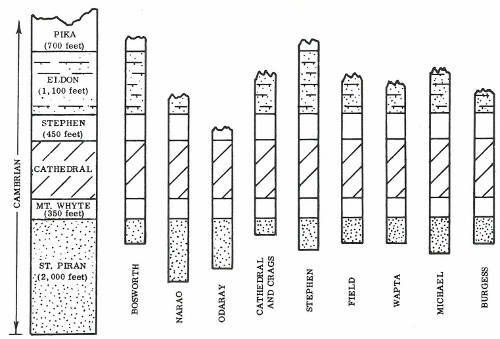 Now when we come to look at these sediments in the form of rocks we find that they can be divided into a number of different formations—the ones shown in the diagram on page 18, with the average thickness of each in parentheses. As we travel to the western part of Yoho National Park we become aware that the rocks there are somewhat different from those of approximately the same age in the eastern section. This is not surprising, really, when we think that the kinds of sedimentary materials being laid down in the ancient seas would differ over the width of the several miles involved. When we go to places now where sediments are being laid down in the sea we can easily see this variation. Near the mouths of rivers, muds and silts may be being deposited, while elsewhere, at exactly the same time but under different conditions, pure lime is being precipitated. This means that the rocks that ultimately form from these materials will be quite different in appearance, yet they were deposited at exactly the same time. The table of formations in the eastern section of Yoho National Park is shown in the left column and the rocks to be seen in the individual peaks are shown in the other columns. The St. Piran Formation was largely made of sands but is now recrystallized to the hard, dense rock—quartzite. The others are mostly limestones with some shaly and sandy layers interspersed among them. All were laid down in the seas that covered this area in the Cambrian period. Something of this nature seems to have taken place during the Cambrian period in the region which is now Yoho National Park. In the western part of the park we find a considerable thickness, perhaps 4,000 to 5,000 feet, of fine-grained sedimentary rocks which have been lumped together and called ‘the Chancellor Formation’. These rocks are  quite different from the limestones and shales of the Mount Stephen and Cathedral Mountain area but appear to be roughly the same age because they are overlain by rocks that are equivalent to the rocks overlying the Stephen and Cathedral rocks. Overlying the Chancellor Formation is the Ottertail Formation, which in most places is a massive grey limestone or dolomite about 2,000 feet thick. Many of the great rock walls on the east side of the Ottertail Mountains from Mount Hurd southward are composed of this grey limestone unit, which is known to extend off to the south as far as Nevada. It must represent a time of long-continued precipitation of calcium carbonate under unusually stable conditions of land and sea. It is found in a few spots on the eastern side of the park, such as on the very cap of Mount Stephen and on Paget Peak which is north of Wapta Lake. Down in the southern corner of Yoho National Park, in the tops of the Ottertail Mountains, a very large part of a great series of sedimentary rocks—called ‘the Goodsir Group’—is exposed. These rocks are named from the towers of Mount Goodsir, whose upper part is composed entirely of rocks belonging to this sequence. A mass of rocks that is unique in the Rocky Mountain System occurs in the valley and on the flanks of Ice River in the southern section of the park. These are igneous rocks—that is, at one time they were molten but they solidified after they were emplaced. Their composition is quite different from most igneous rocks; geologists call them ‘nepheline syenite’. Besides being unusual in that their chemical and mineral compositions are different from most igneous rocks, the rocks in this mass contain veins and small masses of a beautiful blue mineral called ‘sodalite’. Rock formations in the western section of Yoho National Park are shown in the left column and the rocks to be seen in the individual peaks are shown in the other columns. The thick Chancellor Formation on the bottom is made up largely of shaly material with some limestone layers. The overlying Ottertail Formation is a great mass of limestone. The Goodsir Formation, or Group, is composed of thin layers of shale and limestone. The Chancellor, the Ottertail and the lowermost 2,000 feet or so of the Goodsir were laid down in the Cambrian period. The age of the upper part of the Goodsir is Ordovician—the next period of geological time. We’ve now seen what the rocks are made of and how most of them were laid down in the ancient seas that long ago covered this area, and we’ve mentioned the one small mass of igneous rock, but exactly how were these rocks carved into the mountains we see today? As soon as the rocks were laid bare by the retreat of the seas in which they were laid down they were subjected to the ever-present erosive action of rain, running water, falling snow, moving ice, frost, and chemical decay. Of all these agents of erosion, running water has been by far the most important in the carving of the mountains as we know them. For millions of years streams have carried away the debris of all the other agents of decay and erosion, and have themselves carved their valleys deep into the landscape. The story of water erosion may begin on the highest peak. The freezing of a thin film of water under a boulder may wedge it out and tumble it over the edge of a cliff. Heavy rains may loosen rocks and boulders or may lubricate others so that they too join the downward rush. Thus, bits and pieces of rocks are torn from the solid mountains and begin their long journey to the sea. Their first resting place may be in one of the long fan-shaped accumulations of angular blocks and pieces of rock which we can see on the sides of every steep mountain. These are called ‘talus’ or ‘scree’ slopes, and their steepness is generally the maximum angle at which the loose rubble is stable. Climbing on them may be very difficult, particularly on the lower parts which consist of very large, angular boulders and chunks of rock lying in all attitudes where they have rolled or fallen. This means that not only will the surface of the talus or scree slope be very rough and irregular, but slight disturbances—even the passing weight of a man—may cause more sliding and adjustment of the blocks and particles in it. A common sequence of erosion in Rocky Mountain country begins when boulders and smaller particles of rock are wedged off the bare rocky peaks and fall to the talus or scree slopes below. Physical and chemical breakdown of the rocks in the talus produces fine-grained materials which move in the wash of rain and in streams, towards the river. A layer of glacial till made of a mixture of boulders, sand and clay commonly blankets the solid rock underneath the soil and river-fill in such valleys. 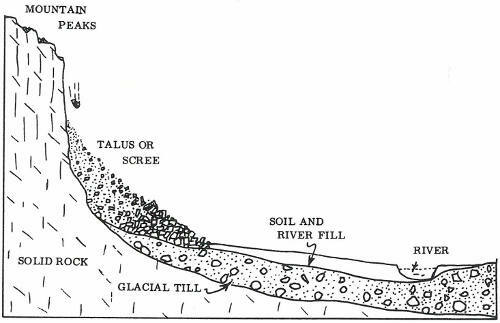 In many places the glacial till is actively eroded by the river and thus contributes directly to the load of sediments on its way to the distant sea. Rivers may wash the bottoms of the talus slopes and carry off some of the boulders and rubble, so that angular pieces and fragments from the talus now become part of the mass of boulders, gravel and sand in the bottoms of stream valleys. Constant rubbing of boulders and pebbles against one another gradually wears them down and the fragments become very finely divided rock flour that looks like mud or silt in the water of the stream. Thus, over the ages, the mass of rocks in the mountains is gradually worn away by the forces of erosion and carried ultimately to the sea, where it rests on the bottom as mud, silt or sand. After a very long period, during which great valleys were carved and the main outlines of the mountains as we know them were shaped by the action of running water, there came a period when the whole of northern North America was covered by a great ice-cap, rather like those on Antarctica and Greenland today. This period of glaciation began about a million years ago and lasted until quite recent times, perhaps 10,000 years ago. Glacier erosion is of two kinds. When an area is covered by an ice-cap, more or less evenly, the movement of ice outward from the centre of accumulation of snow tends to round off the bumps and smooth out the hollows. High in the mountains, however, the action of the glaciers is generally much more localized and accentuated. Around the margins of snowfields or icefields, glaciers push down the valleys, steepening them and deepening them as they go. In the areas of accumulation, great bowl-shaped depressions—called ‘cirques’—are sometimes carved deep into the mountainsides. These  commonly have almost vertical back walls and rounded bottoms. The cutting action caused by the movement of ice and snow toward the centres of cirques and the outlets of snowfields tends to steepen the scenery in the mountains and make it much more sharp and angular. If, for example, cirques are being cut into two opposite sides of a mountain, the two vertical back walls may happen to intersect one another, leaving a razor-sharp rock ridge. It sometimes happens that a rounded mountain-peak of considerable elevation is cut into by cirques from several sides. This process may leave semi-pyramidal towers of rock, like the world-famous Matterhorn, or Mount Assiniboine in the Canadian Rockies. Long tongues of ice extending from snowfields down the valleys as valley glaciers commonly steepen the valley walls, pushing great piles of rock rubble and debris ahead of them. The position of maximum penetration of such alpine glaciers is commonly marked by great heaps of the debris they have left behind. Long finger lakes are sometimes found in such dammed-up valleys, but in others the river was able to cut through the dam and drain the upper valley. Farther back, where the valley walls were much steepened, a characteristic U-shape is impressed on the valley and the bottom is covered with a blanket of glacial debris. 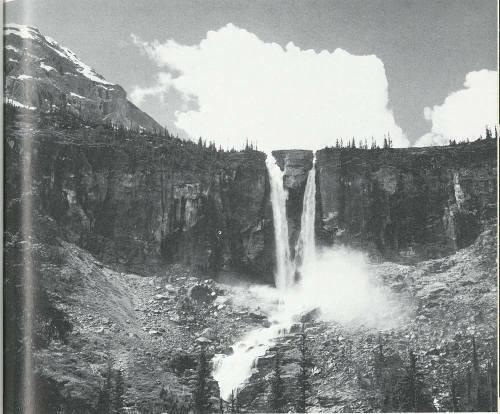 Small streams, occupying shallow valleys on the shoulders of the main valleys, may now tumble over the edge in very high waterfalls, like Takakkaw Falls. The high valleys that the streams run in are called ‘hanging valleys’. 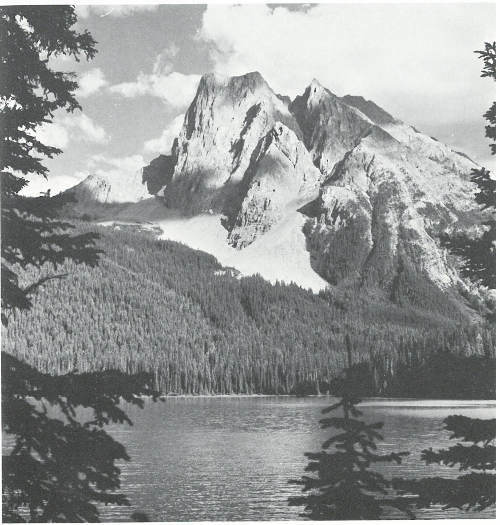 Mount Burgess, the mountain on the back of our ten-dollar bills, thrusts its jagged mass of folded and faulted Cambrian rocks high above the waters of Emerald Lake in this view. Notice the fan-shaped scree slope below the two principal gullies which meet at about the centre of the mountain. Thus we can see how glaciers tend to sharpen up the profiles of the mountains and the scenery. Bowl-shaped depressions with vertical walls (cirques), sharp ridges with nearly vertical sides, sharp angular mountain peaks, U-shaped and hanging valleys—all of these are characteristic of areas of upland glaciation. Nowadays in Canada’s western mountains we can see a few remnants of the ice that covered the whole area in the not very distant geological past; these are the glaciers and snowfields still left on the heights and in protected places. In the few thousands of years since the glaciers modified the shape of Canada’s western mountains, rivers have resumed the carving and cutting of the great mass of uplifted rock. Now, however, their valleys are choked with glacial debris brought from higher places by the moving ice. In some places the cirques or bowl-shaped depressions carved by the glaciers are occupied by small lakes called ‘tarns’, and in other places the long valleys have filled with water and are now long finger lakes. The glacial litter—the vast quantity of sand, gravel and ground-up rock—is in some places distributed and redistributed by flowing rivers over flat valley floors to make braided streams. Steep rock walls and cliffs abound. In summer, when meltwaters from the glaciers and the snowfields make the rivers high, you can imagine what an enormous load of rock debris is being carried to the sea each year from the wasting mountains. The western mountains of Canada show a distinct zoning from east to west at many different places along their length. Undisturbed flat-lying rocks underlie the western plains from Manitoba to near the western boundary of Alberta. To the west this area is succeeded by the Foothills, a region of folded and faulted rocks which have not been greatly uplifted. Still farther west, the Front Ranges of the Rocky Mountains succeed the Foothills along a very sharply marked boundary line. The Front Ranges are made of a series of fault slices of folded and broken rocks thrust together so that they overlap like the shingles on a roof. The region of the Front Ranges is separated fairly clearly from another zone of mountains to the west—the Main Ranges of the Rocky Mountains. Here the rocks at the surface are relatively undisturbed although very much uplifted and deeply eroded. This we can tell because they include some of the oldest rocks exposed in the Rocky Mountain System. Farther west again are the Western Ranges of the Rocky Mountain System, built along a belt of severe disturbance in which the rocks are broken, faulted and severely folded. Yoho National Park lies almost completely within the Main Ranges of the Rocky Mountain System. Knowing this we can expect to find that most of the peaks cut into flat-lying or nearly-flat-lying sedimentary rocks which do not show much more than undulating dips, except near faults where they have been more severely disturbed. To the east and to the west of Yoho are mountains that are considerably more  complex, for these belong to the Front Ranges and the Western Ranges respectively. Travellers in the mountains have long noted the distinctive shapes of individual mountains. These are due to a combination of three things: the kinds of rocks that go to make up the mountain, the structure of the rocks within the mountain, and the particular tools or agents of erosion which have carved the mountain (in the case of the mountains in Canada’s western parks, the rivers and glaciers). 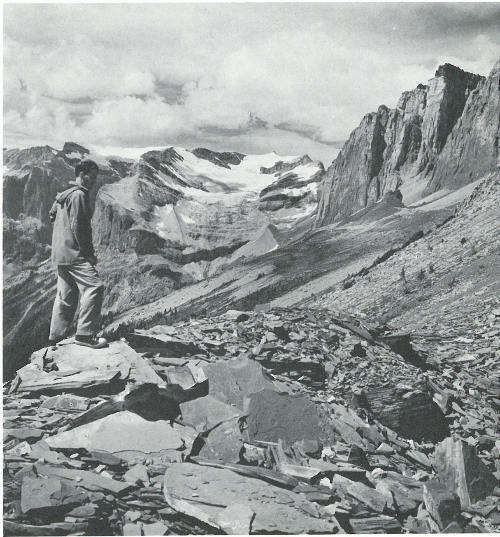 An assortment of rock types which vary from flat-lying to vertical and from parallel-layered to crumpled and folded, has contributed to the many different shapes of the mountains we see in Yoho Park. 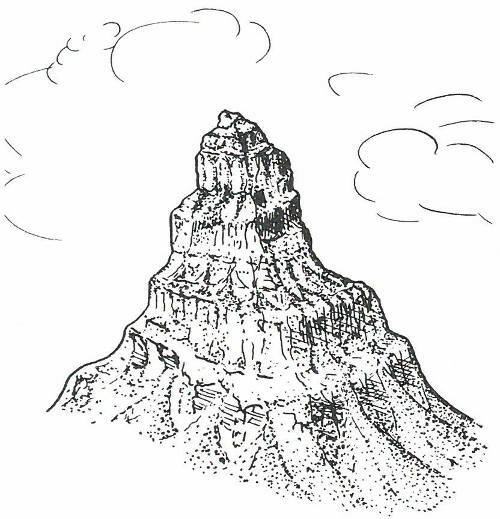 The hundreds of peaks and mountain masses, however, belong to only about eight kinds—the ones you see sketched here. Mountains that are cut into more or less flat-lying sedimentary rocks commonly have profiles in which vertical  steps alternate with flat or sloping terraces. Some such mountains look very much like ancient castles and are thus said to be ‘castellate’ or ‘castle’ mountains. Mountains of this kind are best developed in regions underlain by great thicknesses of rocks in which beds of massive limestone and sandstone or quartzite alternate with less-resistant shale or slate beds. The softer beds are eroded more rapidly, so that the harder beds are undermined and tend to break off at right angles, forming steep slopes and cliffs. Steep-sided needles and pinnacles are sometimes left on the tops of such mountains as the uppermost massive layers are cut away. Mount Eisenhower, Pilot Mountain, the Cathedral Peaks and Mount Stephen are examples. Some mountain peaks are cut into masses of layered sedimentary rocks which ‘dip’ or slope from nearly horizontal to 50 or 60 degrees. 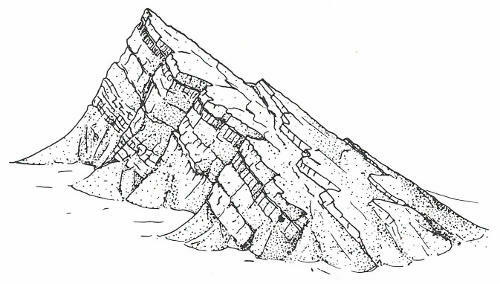 Some of these, like Mount Rundle near Banff, have one smooth slope which follows the dip of a particular rock layer from its peak almost to its base, and, on the other side, a less-regular slope which breaks across the upturned edges of the layered rock units. Other mountains, like Mount Edith Cavell, are cut into dipping sedimentary rocks in such a way that neither side follows the dipping rock layers, and thus both sides are irregular. This fine example of a dogtooth mountain is on the west side of the valley of Amiskwi River, near the western edge of the park. You can easily see the nearly-vertical rock layers. Sharp jagged mountains sometimes result from the erosion of masses of vertical or nearly vertical rock. The peaks may be centred on a particularly resistant bed, in which case a tall spine or rock wall may result. 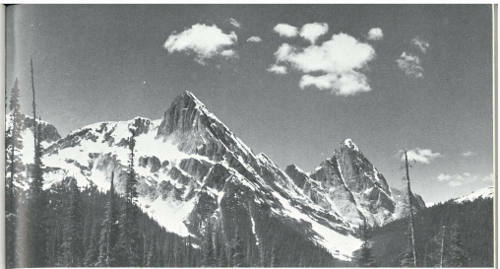 Some of the peaks in the Amiskwi area of Yoho Park are of this kind. If the rocks in a long ridge are vertical, erosion may produce  rows of angular mountains that look like the teeth in a saw. This type can be seen in the Sawback Range near Mount Eisenhower in Banff National Park, and in the Colin Range east of Jasper. Many mountains are cut into more or less homogeneous masses of rock and, as a result, have no particularly characteristic shapes. These we may call ‘irregular mountains’, although individual peaks may be round, conical, pyramidal, or quite shapeless, depending on how they were cut. Mountains are very commonly cut by erosion into masses of rocks that have been folded into great arches and troughs. Erosion over long periods may cut away all the surrounding rocks to leave a mountain with a trough or bowl structure within it. This probably comes about because the folded rocks in the centre of the trough, which is called a ‘syncline’, are more resistant to erosion than those in the surrounding  parts, which tend to split and break during folding. Mount Kerkeslin in Jasper National Park is an excellent example of a synclinal mountain. In some regions of folded rocks, mountains are underlain by great up-bowed or arched masses of rock. Such upfolds are ‘anticlines’ and the mountains are called ‘anticlinal mountains’. Stretching of the rocks on the outside or upper layers results in numerous fractures which in turn make the rocks very susceptible to erosion, so that true anticlinal mountains are rare. Anticlines and synclines, that is upfolds and downfolds, may be seen in the flanks of some mountains that have been developed on tightly  folded rocks. These we may call ‘complex mountains’ because of the complex structure of the rocks within them. Magnificent examples can be seen all along the eastern edge of Jasper National Park. When glaciers cut deeply into rocks that are more or less homogeneous they carve bowl-shaped depressions called ‘cirques’. 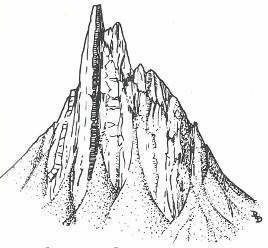 When several cirques cut into a mountain mass but are stopped by a warming of the climate and consequent melting, they sometimes leave sharp, semi-pyramidal towers of rock to which the general term ‘matterhorn’ is given. Mount Assiniboine is an outstanding example in the Canadian Rockies. Fossils of ancient marine creatures are found embedded in the rocks in many places in Yoho National Park. Two localities, however, have so many individual fossils of so many different kinds of animals, in such an excellent state of preservation, that they have become world-famous collecting grounds. One is on Mount Stephen about 2 miles due east of the village of Field and 2,000 to 3,000 feet above it. The other is on the side of the ridge that joins Mount Wapta and Mount Field, at an elevation of about 7,500 feet. The Mount Stephen locality may be reached from the village of Field by an open trail that leads into the woods just back of the office building of the Royal Canadian Mounted Police at the upper edge of town. The trail follows the high shoulder on the left bank of a small brook for some distance, and then, after a climb of about 1,500 feet, crosses over to the other side. A climb of another few hundred feet brings us to the base of a great scree slope covered with slabs and bits of shales and limy shales which contain ‘trilobite’ fossils. These are even more abundant at the upper end of the scree slope. The Mount Field-Mount Wapta locality may be reached by three routes. One trail leads up the side of the great ridge opposite the village of Field and eventually comes out from the south onto the shoulder where the fossil beds are  located. 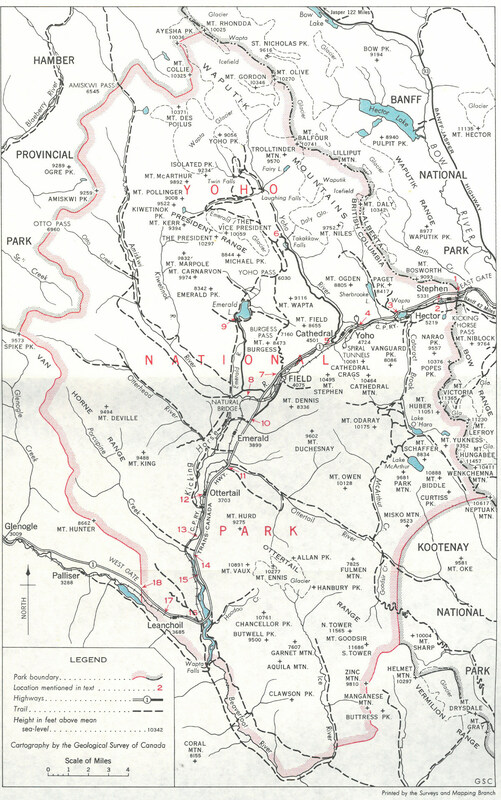 Another route is from Emerald Lake, and a third from Takakkaw Falls, approaches the fossil grounds from the west. The location itself is marked by a distinct pit or quarry on the steep hillside, where students of fossils and geologists have removed many large blocks in order to obtain specimens for study. The major pit was opened up by Charles Walcott, a world authority on fossils of Cambrian age, who made notable contributions to our knowledge of ancient life on the basis of fossils he found there in the early 1900’s. Why are there fossils in these rocks?—At both localities fossils occur in great abundance in the shales and limy beds. In each case it appears that a block of rock containing the fossils has been faulted downward into the surrounding rocks, and has thus been preserved. Erosion seems to have left these behind after removing almost all other traces of similar fossil beds. For students of ancient life, this has been a very fortunate accident of faulting and erosion, because these fossil beds contain hundreds of different kinds of animals in an excellent state of preservation, many of which are not known anywhere else in the world. One can easily realize that the chances of any one animal being preserved as a fossil when it dies are very small indeed for, as its body falls to the bottom of the sea, scavengers may tear it apart, waves and currents may break it to pieces, or it may disappear altogether as the fleshy parts decompose. In these two places in ancient times there must have been unusual conditions to account for the preservation of the remains of so many creatures. Some 500 million years ago, sedimentary materials accumulated in layers thousands of feet thick on the bottoms of the Cambrian seas that covered the area of Yoho National Park. The sediments hardened into solid rock during the vast period of time that followed, and the whole mass was pushed upward and then eroded deeply. The main mass of Mount Stephen exposes thousands of feet of these ancient rocks. Abundant fossils at the spots indicated have made this locality world famous. This scree slope on the side of Mount Stephen is covered with slabs of shale and limestone containing thousands of trilobite fossils. These creatures—extinct for hundreds of millions of years—left their skeletons in the accumulating muds and silts at the bottom of an ancient sea. Now they appear as imprints in the rocks which came from the hardening of the sediments. The townsite of Field is visible on the south side of the braided bottom of Kicking Horse River valley, with the mass of the southern shoulder of Mount Burgess rising beyond. Most creatures have some hard parts—things like teeth, bones and shells which are harder to destroy than soft fleshy parts. The fossil beds here are unusual in that they contain delicate imprints and stains of animals which had very few or no hard parts at all. Dozens of different kinds of soft-bodied organisms which are not known anywhere else in the world have been found in these rocks. This must mean that the chemical conditions on the bottom of the sea during the Cambrian period of time (about 500 million years ago) were unusually favorable for the preservation of animal remains. Furthermore, favorable kinds of sedimentary materials being deposited on the bottom of the sea must have been combined with an unusual lack of scavenger animals and very calm physical conditions. How were these places discovered?—The building of the Canadian Pacific Railway through the Kicking Horse Pass and down the valley of Kicking Horse River was preceded in the 1870’s by a great deal of exploration work by surveyors and engineers, among them Otto Klotz. During the course of his travels Klotz accidentally came across the famous Mount Stephen fossil beds and made an extensive collection for his own interest. This wonderful collection of fossils ultimately came to the attention of expert palaeontologists who recognized at once that it came from an unusual locality. This led, in a few years, to extensive studies of the region. It is interesting to note that the most common fossil in the Mount Stephen locality bears the name of the discoverer; it is Ogygopsis klotzi. Early Canadian geologists, principally G. M. Dawson and R. G. McConnell, made extensive collections of fossils from these places. Some of the specimens were sent to C. D. Walcott of the Smithsonian Institute in Washington. Dr. Walcott, then the leading authority on Cambrian fossils on this continent, became interested at once and came to Field in 1907. For the next 20 years he continued his studies in the area and on the material which came from there. He found dozens of new species of fossil animals which had not previously been found as fossils. Most astonishing of all were the numerous fossils of very delicate soft-bodied organisms which he found in fair abundance, particularly at the Mount Field—Mount Wapta site. His publications on these fossils have greatly influenced thought on evolution—the gradual change in numbers and kinds of organisms on the face of the earth down through the long passage of time from the beginning. The fossils from these localities showed scientists that organic evolution was already well advanced by the time these rocks were laid down, some 500 million years ago. What are the fossils?—The most common and the best-preserved fossils in these Cambrian rocks are trilobites. Trilobites have been extinct now for at least 250 million years, but in their general biological organization they were somewhat like modern crustaceans, such as crabs, lobsters and crayfish. They had a head region, a long central region that included most of the vital organs, and a tail area. In addition, they were divided longitudinally into a sort of central area with rib-like extensions on each side. It is this three-fold arrangement of their skeleton which accounts for the name ‘trilobite’. They evidently had delicate feather-like limbs which protruded to the sides from underneath the skeleton but these are very rarely found as fossils. A pile of waste from the famous Burgess shale quarry on the side of the ridge between Mount Wapta and Mount Field shows where fossil hunters have collected specimens ever since Walcott opened it up 50 years ago. The great cliffs in the right background are part of Mount Wapta. The glacier in the centre background was once more extensive and covered the light grey area below what is now its foot, pushing up the two lateral moraines. The striking appearance of trilobite fossils—their symmetry and the neat organization of their structure—are fascinating to the layman, but perhaps more captivating is the idea that although long since extinct, they once swarmed over the bottom of the seas. Some of the slabs on the scree slope at the Mount Stephen locality are covered with trilobite imprints, and they are also found at the Mount Field—Mount Wapta locality. As one might expect from an accumulation of the remains of things dead, fossils are not always complete, especially trilobites which probably moulted as modern crustaceans do. Very commonly the head region is found separated from bits and pieces of the remainder of the organism. At these two famous fossil sites at Yoho, however, many complete or nearly complete specimens are to be found—another reason why these localities are so unusual. In addition to trilobites, careful search among the rock surfaces will show imprints and delicate tracings of many other varieties of primitive animals. Some are visible only by turning the surface of the rock so that it reflects the light; the fossils become noticeable as areas that are slightly shinier than the bare rock itself. Fossil imprints occur in the rocks at two world-famous localities in Yoho National Park. 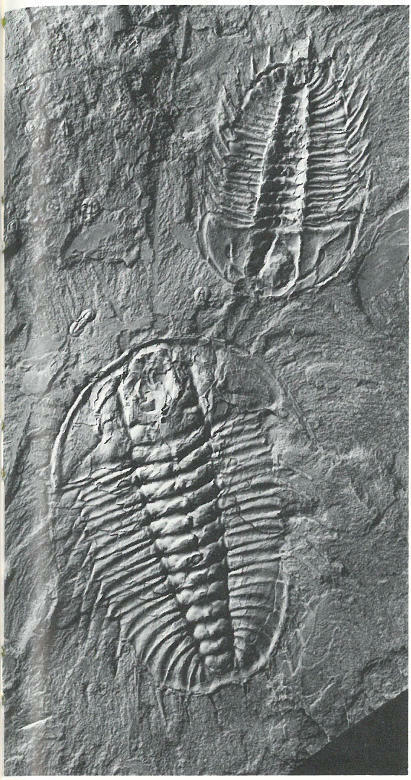 On this slab two large trilobites and several small ones are clearly shown. It is interesting to note that the humps and hollows of the large trilobites seem to reverse themselves when you turn the picture upside down. With this background knowledge of the fossils and their history, it becomes an especially interesting experience to stand on one of these high places and ponder the long chain of events which has led to the present. It began perhaps a billion years ago. At that time the whole area sank slowly beneath the shallow seas that then covered this part of the continent. Hundreds and even thousands of feet of mud and silt gradually filled the sea, just keeping pace with the sinking of the land beneath, so that all the sediments were laid down in shallow marine waters. About 500 million years ago great swarms of primitive animals, including numerous trilobites, lived on the bottom of the seas, and when they died they sank slowly into the muds and silts accumulating below. Then, hundreds of millions of years later, the whole area was squeezed and compressed with folding and faulting of the great thickness of rocks that had been laid down long before as soft marine sediments. Erosion by rivers, and later by glaciers, cut deeply into the rocks beneath. In the thousands of years since the glaciers left the area, modern rivers and streams have resumed the erosive attack on the mountain area. At two places this erosion has uncovered small patches of rocks full of the remains of the organisms that died so long ago. Finally, men appeared on the scene in the 1870’s and 1880’s and discovered this ancient cemetery, which still intrigues us. 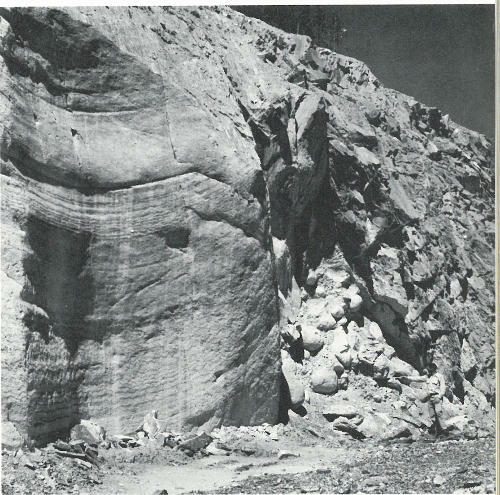 The photograph on page 45 shows a rare geological phenomenon—tall columns of bouldery gravels capped by very large boulders. These are the famous Hoodoos of Leanchoil. The “Hoodoos” are formed when erosion eats into steep banks of partly consolidated, limy glacial debris. The boulders on top of these pillars seem to protect the loose material underneath from being cut away. These unusually good examples occur along Hoodoo Creek not far from Leanchoil. To get to this interesting place drive along the main highway to the east end of the bridge over Kicking Horse River at Leanchoil, near the southern end of Yoho National Park. Another road, conspicuously marked as leading to the Leanchoil Warden’s Station, branches off to the southeast. As you travel along this branch road keep to the left at the one intersection and drive about a mile farther on to where the road ends in a picnic ground beside Hoodoo Creek. From here a well-marked trail leads up the valley of Hoodoo Creek to where the Hoodoos are found standing patiently together, wearing their stone hats at different angles. It takes about a half hour from the car-park at the picnic ground. The most dramatic view is from the upper of the branched trails, where the Hoodoos are first sighted. The lower trail provides a very different view—a view that is much less striking but carries with it the explanation of how the Hoodoos originated. These unusual features have been caused by the erosion of partly consolidated or hardened glacial deposits. A great mass of sand, gravel and boulders with a weak cement of limy materials has been left on the steep wall of the valley of Hoodoo Creek by the glaciers of long ago. Scattered through the mass are large boulders. Deep gullies appear, as water from above cuts deeply into the easily eroded material. The flanks of these gullies and the material generally are also susceptible to ordinary erosion by the rain and melting snow. In this particular region, which is sheltered from driving rains, the boulders protect the material beneath them from the fastest kinds of erosion. Each boulder very quickly becomes etched out of the enclosing rocks, except for the part which is best protected by the boulder—the part  directly beneath it. Thus the gravels, sands and small boulders are removed from all sides so that eventually the tall hoodoos are left. Some of the best-developed hoodoos in the world are to be found here. 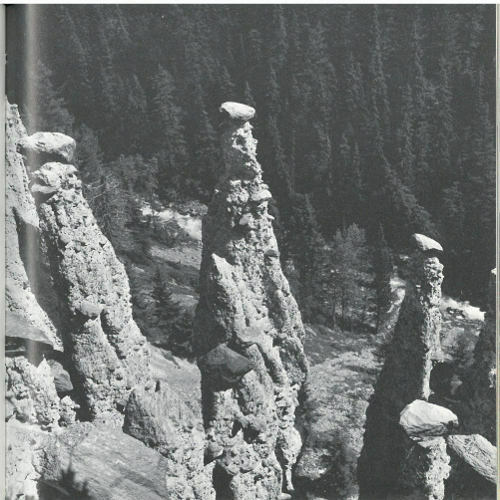 You can see them in all stages of development: from the very first uncovering of a large boulder to the partly developed column with the boulder on top, to the tall pillar with its cap-rock, and then to the partly or even largely eroded hoodoo which has lost its cap and is wasting away rapidly. The rate of erosion of these hoodoos is not very great when measured from year to year, for photographs taken 20 or 30 years ago show that there has been little change since then. When you look at these unusual capped spires you can think of the way they were etched out of old glacial deposits by the gradual processes of erosion. You may realize that they are very temporary features produced under very special circumstances—features that will eventually disappear entirely. Back at the picnic ground where cars are parked, one is impressed by the clear rushing water of Hoodoo Creek. Below this spot the creek gradually diminishes in volume and disappears as its water soaks into the gravel flat. It thus has no apparent junction with Kicking Horse River, although that is where its waters eventually go. At almost the exact centre of Yoho National Park the main road has a branch that leads west, then northward to Emerald  Lake. Along this road, about a mile from the junction, a turnoff to a parking lot leads to Kicking Horse River and the Natural Bridge. This is an interesting place in summer when the melting glaciers in the headwaters provide lots of silt-laden waters to Kicking Horse River. Just above the bridge the river begins to flow faster, then it plunges through a narrow defile and under an overhanging section of the rock. All of the waters of Kicking Horse River pour through this small hole. The rocks here have had a very complicated and rugged history, beginning with their deposition as limy sediments in Cambrian seas of nearly 500 million years ago. After they had solidified into rock they were heavily folded by various earth pressures. Proof of this can be seen in the intricate folded structure in the rock. A sheety breaking in the rocks suggests further that they were sheared at a still later date. They were then broken by jointing, more or less across the general trend of the other features. These rocks were uncovered in fairly recent geological times when, following glaciation of the area, Kicking Horse River began to cut down into the valley again at this particular spot. Some of the massive limestone layers formed a barrier to the downcutting process, so that waterfalls were produced. Water, however, leaked down into some of the openings caused by the joints and began to dissolve small quantities of limestone from the walls. One of these openings appears to have gradually enlarged until now it takes the whole volume of the Kicking Horse River. Thus the Natural Bridge has been formed where the river has cut underneath the lip of an old waterfall. 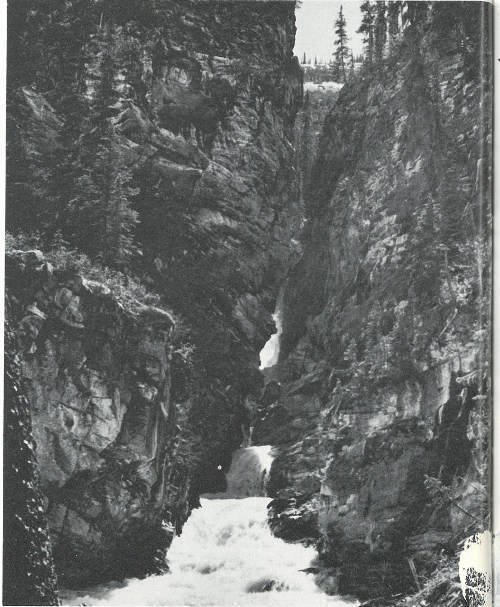 The Natural Bridge is formed by Kicking Horse River where it cuts through limy rocks in a narrow tunnel. At one time the river flowed in a great waterfall over the lower edge of the cliff, but its waters gradually ate their way downward behind the resistant layer until now the hole they have carved carries all the water of the river. Mount Stephen looms in the right background. As the hole under the Natural Bridge is gradually increased in size, and as erosion attacks the bridge itself, rocks will fall off until only two projecting points of rock remain, with the river boiling between them. It is possible that the seething waters just above the present Natural Bridge are beginning to uncover another hard layer, and this in its turn may eventually produce another natural bridge. Proof that the limestone is soluble in the river water is visible on either bank where small solution holes can be seen pitting the rock surfaces in many shapes and sizes. Veins of the white mineral ‘calcite’ are cutting the limestone in many places. Kicking Horse River flows generally southward through Yoho National Park until it gets to Leanchoil, where, about 2 miles below the main highway bridge, it turns sharply to the northwest. Its valley here is much different from the one it has been in before. Just at the turn the waters of Kicking Horse River pour over a great ledge, to make Wapta Falls. At Wapta Falls the river crosses a series of rocks that stand very steeply. The rocks themselves are broken and twisted but some strong resistant layers are eroded more slowly than the rocks on either side. When Kicking Horse River was cutting into its rocky bed, the soft-rock layers were quickly  worn away and the hard layers began to stand up as ridges. One by one these formed barriers in the path of the rushing water. In one place a few hundred feet downstream from the present lip of the falls a particularly resistant layer, which may still be seen sticking out of both banks of the stream, was undercut enough on the downstream side to form waterfalls. Erosion of the softer layer on the upstream side of this resistant strut was followed by a breaching of the rock wall itself, and the first falls began to change into a very steep chute. As time went on the soft-rock layers above the chute were worn away very rapidly until another resistant layer was uncovered. This in turn formed another waterfall, and during the time of its maximum development the lower strut and all traces of the lower waterfall were gradually worn away. History repeated itself at the lip of the second falls as the soft-rock layers on the upper side were eroded and the resistant rock was broached. Then it was cut deeply so that the water was able to flow behind and through the newly made opening rather than over the resistant rock rib itself. 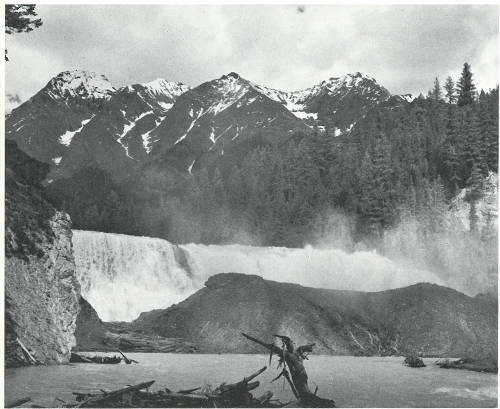 The remains of this rock rib may still be seen just below Wapta Falls, and it is still high enough to obscure much of the view of the falls for people standing below them on the right bank of the river. The rushing waters continued to erode the rocks behind the second falls. As the wearing back of the lip progressed, still another resistant rock layer was uncovered. And this forms the lip of the falls as we know it today. Wapta Falls occurs near the spot where Kicking Horse River changes its direction abruptly from south to northwest in the southern section of the park. As the river plunges over a series of steeply dipping rock layers the softer ones are quickly worn away; the resistant layers hold up the cutting action of the water and thus form the lip of the falls. The snow-covered peaks of the Chancellor Range rise in the background. Looking at the waterfall we can picture how the rushing water is tearing and pulling at the rock, dissolving its way along joints and small cracks to loosen and remove new blocks, and wearing away the rock by abrasion of moving pebbles and sand in the stream bottom. Even now it is undermining the resistant layer at the edge of the falls, for you can see that the lip of the waterfall is a little higher than the bottom of the stream just above it. It is interesting to speculate on why the falls and the lower steep gorge of Kicking Horse River below this point are there at all. As one stands on the higher ground to the northwest of the main bridge over the river at Leanchoil, one can see that the main valley system seems to follow off to the southeast from the upper part now occupied by Kicking Horse River above Leanchoil. It appears from studies made in the district that at one time the preglacial drainage undoubtedly flowed in this direction and continued southeastward into what is now Kootenay National Park. Due, however, to uplift and change in the level of large mountain masses and to modification of the valley during the glacial period, the river waters were diverted to the northwest instead. Since that time the rushing waters, which fall nearly 1,000 feet in a very few miles before joining the Columbia River at Golden, have cut a very steep walled, gorge-like valley. 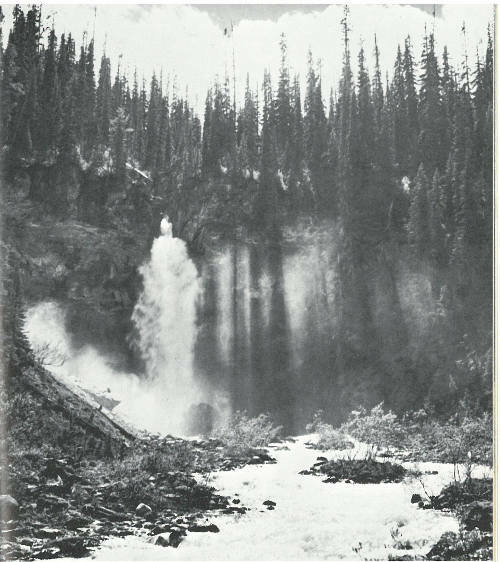 Wapta Falls is one of the many results of the dislocation of the ancestral Kicking Horse River. One of the most spectacular sights in Yoho National Park is Takakkaw Falls, as it plunges several hundred feet over a nearly vertical cliff into a flat-bottomed valley. It is easy to see that these falls are formed where the waters of a small meltwater brook fall over a great cliff. 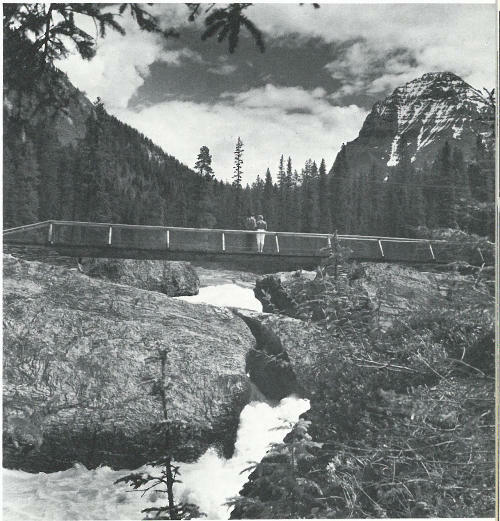 The complete story, however, goes back a very long time into the history of Yoho National Park. In an earlier section of this book we described how at one time in the not very distant geological past the whole of northern North America was covered by a great sheet of ice,  and how in its later stages the ice melted faster than it accumulated. The western mountains then were much more extensively covered by glaciers than they are now. A great tongue of ice, with its head in what is now Wapta Glacier, pushed down the valley that is now occupied by Yoho River. This glacier moved down a valley which had been carved by the ancestor of Yoho River in even more distant geological times. 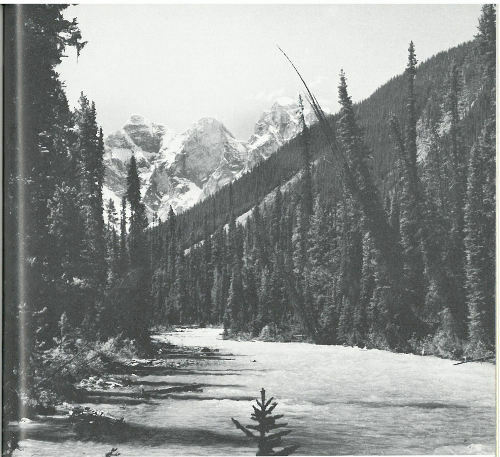 It is almost certain that several times previously glaciers occupied this valley and were later succeeded in times of warmer climate by a river like the Yoho River of today. This means that the last glaciation of the area was but a repetition of former chapters in the history of the development of this valley. Glaciers tend to make U-shaped valleys from the ordinary open-V shape of river valleys by steepening the walls and flattening the bottoms. Glaciers cut even harder where spurs of rock or bends stick out into the old river valley and thus make even higher cliffs on the valley sides at these places. 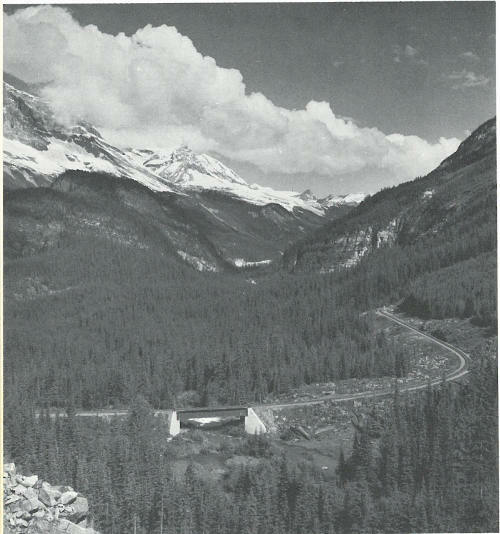 A view up the valley of Yoho River from the lookout over the railway tunnels on the main highway shows the inner Yoho River valley to be generally of a U-shape. Now to get back to Takakkaw Falls—it is because of the steepening of the main valley wall by the glaciers and the making of great cliffs on its sides that the falls we see today are there at all. Back on the hills and out of sight to those on the valley floor the Daly Glacier comes down from the Waputik Icefield on even higher ground near the continental divide. We find the end of the glacier at the place where melting balances the forward motion of the ice. From this ice-front there issues a stream of meltwater which, following the natural contour of the land, eventually finds its way to the edge of the great cliff and then leaps to the valley floor below. Takakkaw Falls in a spectacular hanging-valley-type waterfall on the east side of Yoho Valley. Its waters come from the melting of Daly Glacier, more than a thousand feet above Yoho River. This spectacular leap over the edge of a glaciated U-shaped valley is several hundred feet high. Running water is an erosive agent, so the brook has carved a small gorge since the time that this meltwater first began flowing over Takakkaw Falls. Part of this is visible at the top of the cliff where we can see Takakkaw Creek boiling in among the cliffs and holes it has carved. A high plume of falling water is always a spectacular sight. Two of them occur side by side at Twin Falls in the northern end of Yoho Valley, presenting one of the most beautiful sights in all of the Rocky Mountains. Any flowing river cuts into its bed by solution, by abrasion from moving pebbles and sand, and by the shear push of the moving water. Most rivers in their courses split and rejoin a number of times as a result of cutting down in different places with different speed. Perhaps a joint system, or layering in sedimentary rocks, or accidental glacial scour will have made places where a river splits and flows around a small island to rejoin on the other side. This happens in Twin Falls Creek, and under ordinary circumstances we would make no mention of it at all. Here, however, it happens right on the edge of a very high rock wall. The two branches of the split river come to the edge of a great cliff and fling themselves over it to the rocks below. It is this peculiar accident of placement of the splitting of the stream which accounts for the Twin Falls. This great cliff was carved into the Cathedral limestone by glaciers at a time when the whole valley was occupied by moving ice. Now the meltwaters from Glacier des Poilus form a large stream which happens to split into two branches just above the cliff, making the unusual spectacle of two glorious waterfalls side by side. Below the falls the waters gather together again from the dripping rocks to reconstitute Twin Falls Creek, and then continue their plunging fall toward the bottom of Yoho Valley. Twin Falls Creek gathers its waters below the Twin Falls themselves and plunges through this narrow canyon. This view is from the trail just as it begins to climb steeply toward Twin Falls Lodge. The beauty of this spot owes a great deal to the glaciers, both past and present, for it is the meltwater of the present Glacier des Poilus that supplies the creek itself and it was the great glacier in the main Yoho Valley long ago which cut the huge cliff over which the falls now tumble. Much of the great heap of angular fragments and rock rubble at the foot of the cliff has been sprung out and wedged out by frost action in recent times. The water that falls over the cliff is blown as spray quite extensively over this rocky waste but most of it trickles back again to return to the main stream. By the time Twin Falls Creek gets to the small bridge on the trail below the lodge, almost all the water is once again united in a single stream. Just below this spot it plunges into a very steep walled chasm of its own cutting and falls several hundred feet again before reaching the general level of the valley floor below. This steep cleft in the rocks may be seen from the trail to the lodge just below the last steep climb. Emerald Lake is one of the very beautiful gems found here and there along the length of the Rocky Mountain System. On calm days in summer its pale blue-green waters reflect the snow-capped mountains on all sides and the tall spruce forests on its shores, while the still air carries the sound of rushing streams from the melting glaciers and the occasional rumble of falling rocks or ice. How was it made? 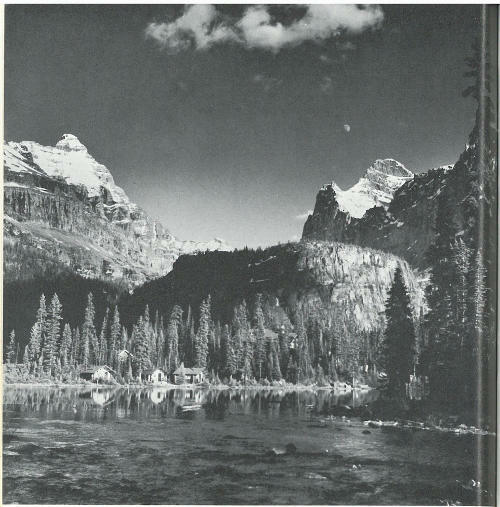 At a time when the climate was considerably colder than it is now, glaciers—whose remnants can still be seen high up  on the President Range to the north of Emerald Lake—occupied the great bowl-shaped depression framed by Mount Burgess, Mount Wapta, Michael Peak and the rest of the President Range, and Emerald Peak. Feeders came in from the north and through the passes that now lead to Yoho Valley and the Mount Burgess saddle area. This mass of moving ice pushed slowly southeastward and joined other glaciers coming from other valleys. When the snow that was feeding the glaciers at their heads became less each year, and melting began to overtake the movement of the ice, the ice began to retreat. Eventually the glaciers occupied only a part of the bowl described above, and the materials which they were scraping off the mountains were left as a shallow dam across the valley. When the ice left the area almost completely, as it has now, the meltwaters filled the depression behind the dam of glacial debris; thus Emerald Lake was formed. The colour of the water of Emerald Lake—and other glacier-water lakes like it—is due to the very finely divided sedimentary materials suspended in it. As the glaciers melt, their meltwaters pick up a variety of sedimentary materials and carry it down the stream. The coarsest debris—the gravel and the boulders—is left behind at the first opportunity. (A delta or outwash area made of this kind of material can be seen just to the north of Emerald Lake.) The more finely divided sedimentary materials stay in the stream farther along its course and make the water cloudy and grey. After the stream empties into a quiet lake (like Emerald Lake) and stands for a while, only the very finest suspended matter is left. The scattering effect which this has on the light combines with the reflection of the blue sky to give the glorious blue-green or emerald colour to the water. Emerald Lake lies at the bottom of a wooded valley surrounded by snow-covered mountains. In times of complete calm like this, the noise of the streams can be heard for many miles as they busily cut their way into the thousands of feet of rock that was laid down in the seas which covered the area millions of years ago. The bright strip to the left of the centre is part of the delta of one of these eroding streams. The water of Emerald Lake, like that of many lakes in the glaciated mountains, is pale green or turquoise from the finely ground-up rock flour suspended in it. Lake O’Hara lies in a deep bowl left by glaciers which extensively covered the mountains at a time when the climate was colder. The waters of the lake, which come from the melting glaciers on all sides, are held in by a dam of rock waste left by the glaciers as they melted and retreated. Like Emerald Lake and so many other lakes in the glacial regions of the world the water of Lake O’Hara is a very beautiful pale green due to the finely divided sediment suspended in it. This is really rock flour that came from the grinding of the nearby rocks by the moving glaciers. Lake O’Hara nestles under nearly vertical rock walls at the head of the glacial bowl in which it lies. On all sides towering peaks and great cliffs are cut into vast thicknesses of quartzites which started off as sands in the ancient sea-bottoms in Cambrian time. River erosion, and later glacial erosion, have carved the deep valleys and cliffs that make the scene so spectacular. On the south side of the lake and a short distance above its shores is the ‘Crystal Cave’. Here, little openings in the quartz-rich rocks are lined with small clear crystals of quartz which have come from the solution of silica in ground water and its reprecipitation in small openings in the rock. Lake O’Hara lies in a bowl of magnificent castellated mountains which are cut into a vast thickness of nearly horizontal sedimentary rocks. These were laid down as clean sands alternating with mud and silts in the Cambrian seas that covered this area some 500 million years ago. The uplifted mass of rocks which resulted from the hardening of these sediments has been carved into these beautiful peaks. 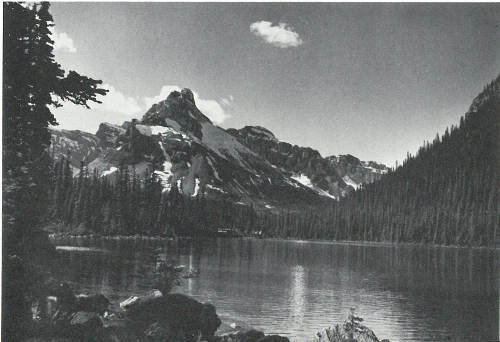 A view from the south shore of Lake O’Hara shows Cathedral Mountain on the skyline to the left of centre and Vanguard Peak cut into rocks which dip gently to the right or east. A little farther around toward the east end of Lake O’Hara is an unusual waterfall. A cliff several tens of feet high, almost beside the lake, is capped by a scree slope made from angular boulders and fragments of rock which have fallen from the cliffs nearby and have been pushed to the edge of the cliff by glacial action in the valley above. Glacial meltwaters coming down the valley above disappear beneath the porous mass of rock waste. When they come to the edge of the cliff, however, they emerge from their rocky cover and fall as a series of cascades, which have been named Seven Sisters Falls. The valley bottom from the mouth of Yoho River to beyond the village of Field shows a splendid example of a ‘braided river’. It can be viewed very well from almost any point along the main highway between the railway overpass and the bottom of the hill where the road goes on to the flat itself. Braided streams result from the heavy overloading of river waters with debris. They are especially common in regions of recent glaciation where fast-flowing streams pour off steep mountain-slopes into flat-bottomed valleys. Great quantities of loose glacial rubble of all sizes, from huge boulders to fine silt and clay, are washed rapidly into the stream valley below where the slower-moving river is inadequate to handle the load. The river flowing in the debris-choked valley bottom splits and rejoins in a great number of channels as it wanders over the deposits of its own making. In times of heavy flood much of the valley may be covered with water at any one time although the main thread of the current splits and rejoins, following the same pattern as in times of low water. When fast-flowing rivers become heavily loaded with rock debris passed to them by melting glaciers, they commonly strew their load across the first flat valley floor encountered. The water of the river then wanders back and forth in channels—called ‘braided streams’—which join and split, join and split. This view looks down the Kicking Horse River Valley just above the village of Field to the Van Horne Mountains in the background. If you were to look carefully at the boulders and cobbles of material being carried along on the braided flats at this locality you would find that the rocks have come mainly from the nearby mountainsides; but among the rocks you would also find some boulders which have been carried by glaciers for several miles. There are other places, such as at the foot of Mount Stephen, where scree slopes made of frost-wedged and recently pulverized material are being fed almost directly into the stream system. The main road through Yoho National Park passes through an interesting rock-cut at a big bend about half-way between the bridge over Ottertail River and the one over Kicking Horse River at Leanchoil. On both sides of the cut the rocks belong to the Chancellor Formation. They are sedimentary rocks that range from massive to broken and sheared, fine-grained and finely banded. In some places the bedding or layering in them is very conspicuous but in others it has been completely obscured by the shearing and breaking which the rock has undergone during the processes of mountain-building and later faulting. This road-cut in the big bend of the main highway about 2 miles north of Leanchoil Bridge looks like any other road-cut until you stop and look at it carefully. It appears from the shape of the walls that the road-builders have cut through a number of old ‘potholes’. These are formed in the bottoms of fairly fast flowing streams by the whirling action of boulders, which go round and round and eventually bore holes right down through the rock. At this locality, part of two or three of the smooth-walled round potholes and some of the very well rounded boulders are visible. The wall of the rock-cut on the outer side, that is the west side, of the main part of the bend looks quite different from that in other places. Several round and smooth surfaces which appear to be parts of vertical cylinders seem to be intersected by the rough, recently-cut walls. One small pocket of material that is very unusual for this area is found near one of the smooth-walled parts. From the shape of the walls at this spot it appears that the road-builders have cut through a number of old ‘potholes’ which were carved when the drainage system of the area was quite different from now. Potholes like these (of which only parts are left here in the walls of the road-cut) are cut in the bottoms of fast-flowing streams when boulders and gravel get trapped in small corners and pockets where fast currents can whirl them about. They promptly start cutting round holes and the currents keep the boulders in motion to enlarge the potholes and cut them downward. If a pothole is cut into rocks that differ in hardness then parts of the pothole will be smaller or larger than others. The road-builders have removed almost all visible evidence of the potholes from this place, except for the smooth walls of one or two. In addition, a small pocket of the very round water-washed boulders and some gravel is left in one part of the road-cut just to the north or northeast of the last of the pothole surfaces. The photograph on page 67 clearly shows the wall of one of the potholes and some of the gravel and boulders we have just described. Consider for a minute the number of road-cuts one may pass in the course of a long trip without noticing the fragments of geological history written in them. Lead and zinc have been mined intermittently over a period of some 70 years from two sets of deposits near the head of the Kicking Horse Valley. One of these, the Monarch Mine, is on the north side of Mount Stephen; it can be seen from the main highway just below the spiral tunnels lookout. Two or three openings in the steep cliffs above the top of the talus slope, rusty marks on the cliff walls, and some of the old mine buildings show where it was. More or less opposite this spot and low down on the flank of Mount Field is another set of holes, marking the site of the Kicking Horse Mine. Over the years more than 800,000 tons of ore—grading 7 per cent lead, 10 per cent zinc, and a little more than 1 ounce of silver per ton—was produced from these deposits. The first discovery of lead-and-zinc ore was made in the talus at the base of Mount Stephen when the Canadian Pacific Railway was being built through here in 1884. The loose, mineralized fragments were quickly traced back to the cliffs above and some development was soon undertaken. Since that time there has been intermittent activity at the Monarch and Kicking Horse mines, ending in 1952 when they finally closed down. The property changed ownership many times during that period and each change usually resulted in a renewal of operations and the discovery of more orebodies deep inside the mountains. 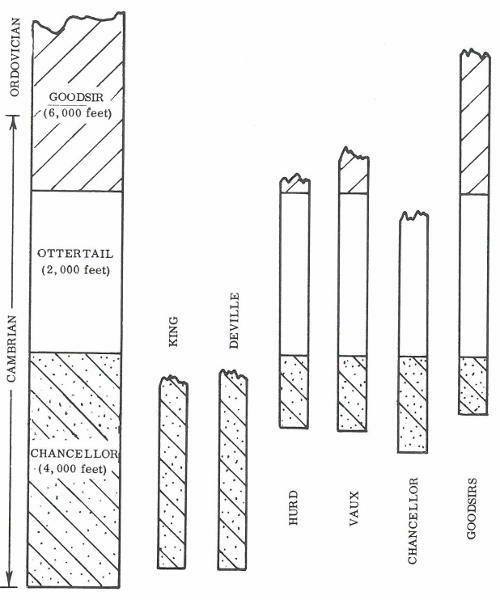 The orebodies in both mines consisted of elongated masses of mineralized limestone and dolomite which in general shape were not unlike flattened cigars. These were enclosed in  barren rock with only the ends of some of them sticking out of the cliffs in the mountainsides. They trended into the mountains on either side of the valley, generally in the same directions as the extensions of a line joining the two mines. The valuable minerals were galena and sphalerite—combinations of lead and zinc respectively, with sulphur. Pyrite and chalcopyrite—combinations of iron and iron-plus-copper with sulphur respectively—were also very common in the mineral bodies. The silver which added some extra value to the ores was not visible. The orebodies, so far as is known, are entirely worked out. All the old tunnels and underground workings now lie black and empty. The surface workings are also nearly all gone. The only remnants of this former scene of noisy activity of men and equipment are a few rusted irons and empty tunnels and galleries where the only sound is the occasional dripping of water. As you drive across Yoho National Park and along the side roads you pass a number of viewpoints, campspots and other places where the view is especially good or where there are things of particular geological interest. 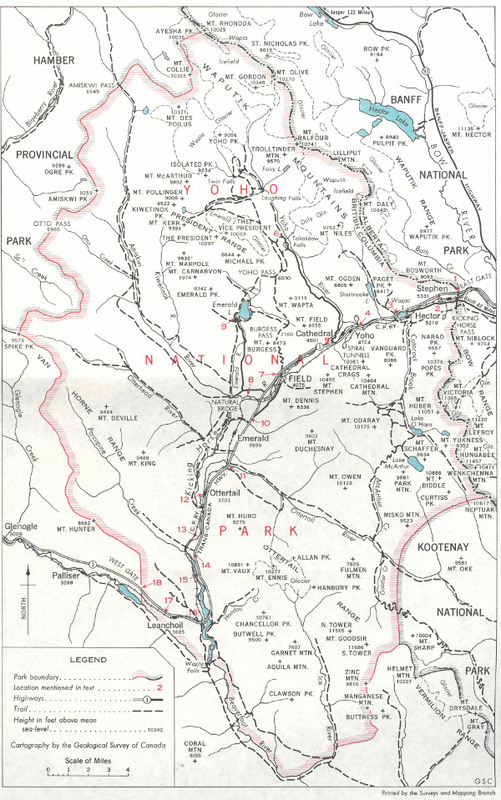 These are noted by number on the map at the back of the book and are described here. The localities are numbered from east to west, so that people driving in this direction through the park will be travelling upward in the numbered localities. West-to-east travellers can use this guide by following the localities downward in number—that is, from No. 18 (West Gate) to No. 1 (East Gate). The approximate distance between adjacent stops appears between the sections describing them. It is well worth stopping here to have a look at the scenery and to look around in a geological way. 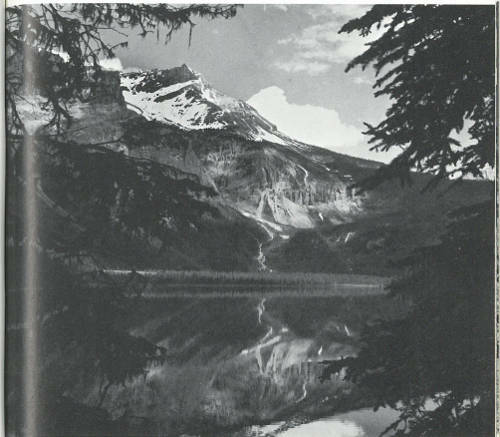 When we discussed ‘divides’ on page 2, we mentioned that the eastern boundary of Yoho National Park is on the continental divide—the height of land separating waters draining eastward to the Atlantic from those draining westward to the Pacific. At this spot it may puzzle you a little to see that even on the western side of the divide the road seems to slope to the east, but if you look into the valley below you will see the explanation for this. It is the way the highway runs diagonally along the shoulder of the mountainside, and its slope has little to do with the flow direction of the water below. The divide comes down the middle of the three ridges which you can see across the valley to the south; it crosses the valley and then continues into the hills back of you, through the peak of Mount Bosworth which is not visible from here. As you look across at the mountain mass on the other side of the valley again, you will see Mount Niblock on the east, a smaller dividing ridge in the centre, and Narao Peak on the right. All three consist of great thicknesses of layered Cambrian quartzites dipping generally westward at gentle angles. 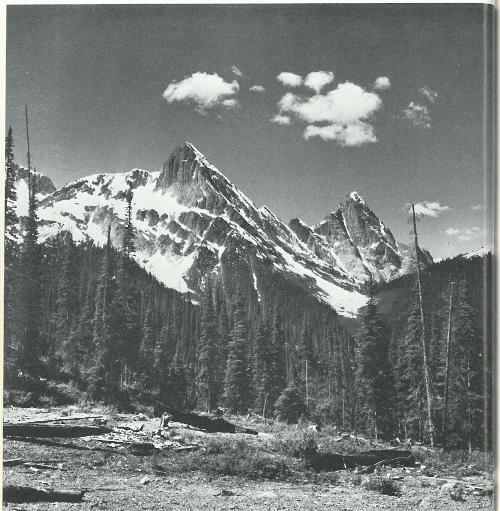 As you face west, Vanguard Peak looms on the left with Cathedral Mountain even higher on its left and the ragged Cathedral Crags to its right. The low notch through which the road travels to the west frames Mount King at about the limit of visibility some 18 miles to the west. A view to the eastward extends over the wooded valley of Bow River to the Slate Mountains on the far side. The road angles along the side of the mountain above the irregular valley-bottom which here has a small lake in it. This lake probably represents the space occupied by a large lump of glacial ice left behind during the melting of the glaciers that once occupied this valley. All around the stranded ice-block, gravels and sands were being dumped by the meltwaters from the surrounding glaciers. When the block of ice itself melted it left a low area which has filled with water to make Sink Lake. Its pale-green colour is partly due to finely suspended, glacially ground rock flour,  and partly to the very light colour of the bottom which reflects the light through the water. The view of the mountains from this stop includes the great mass of Vanguard Mountain, with Cathedral Crags and their snowfields lying westward and a little to the left. Part of Mount Stephen is visible, as is a fragment of the mountains on which Mount King is situated, some 17 miles to the west. Across the valley you can see Narao Peak on the right, Popes Peak looking like a layered cake in the centre, and Mount Niblock on the left. Together they are an impressive array of layered sedimentary rocks of Cambrian age, dipping gently to the west. A steep-walled cirque with a scree slope near the bottom lies near the base of this mountain mass. At the bottom of the cirque—but hidden by the woods and the slope of the land—is tiny Ross Lake, framed by great cliffs of quartzite on all sides. You can see all along the roadside here that the outcropping rock is hard dense quartzite. It was deposited as sandstone in the bottom of the ancient Cambrian sea about 500 million years ago. High banks of washed glacial debris line the north side of the road. The waters of Wapta Lake are probably held in by a great mass of the same water-washed glacial debris which was dumped into this particular part of the valley at the time of the waning of the major glaciation. The brook  at the outlet of Wapta Lake, which eventually finds its way to the Pacific Ocean many miles away, is busily cutting into these sands and gravels. After flowing over a bouldery bottom for some distance it cuts deeply into the rocks below to form a steep canyon filled with turbulent water. To the southwest the back of Cathedral Mountain is seen to have two very different looking halves, separated by a fault or break. Mount Stephen lies generally southwest, with its snow-covered flat-layered top visible from here. Across the lake all the mountains are very clearly made of layered sedimentary rocks that dip gently to the west. You may note the debris-covered sloping shoulder of Mount Narao from this vantage point. The back slopes of Mount Victoria with its glaciers and icefields also show quite distinctly from the west end of Wapta Lake. Another view of these mountains is the one in Banff National Park that provides the spectacular backdrop to Lake Louise. A view to the eastward straight along the highway shows the Slate Mountains with their high peak, Mount Richardson, looming in the distance about 10 miles away. Once again all the rocks in view are gently dipping lower Cambrian quartzites. Several interesting geological features may be seen from this part of the highway, quite aside from a good view of the double spiral tunnels on the Canadian Pacific Railway. To the north-northwest, straight up the valley of Yoho River, you look into the heart of the main ranges of the Canadian Rockies. The great mass of gently dipping rocks to the right is Mount Ogden. On the west side of the valley the bulk of Mount Field frames the immediate view, with the flank of Mount Wapta beyond it. Still farther north along that side is the dazzling white of Emerald Glacier and the snowy mountains of the President Range. Large snowfields and glaciers can be seen at the far end of Yoho River valley; they supply the water to Yoho River. The sharp point of Yoho Peak sticks up in the middle of this white mass and separates the Glacier des Poilus on the left from Wapta Glacier and Yoho Glacier just to the right. In the heavily wooded valley of Yoho River one sees the erosive effects of the glaciers that once occupied the whole of this area. The valley was first carved by rivers and then heavily modified by the moving ice, mainly by having its walls steepened and parts of its floor covered with glacial debris. The road in the valley bottom leading to Takakkaw Falls and beyond may be seen in a few places. On calm days the roar of the rushing waters in the brooks just below the spiral tunnels lookout can be heard very clearly—telling us that the relentless processes of erosion are going on, even as we watch. This view is up Yoho Valley from a spot near the railway-tunnel lookout. The mass of mountains in the far left is part of the shoulder of Mount Field—Mount Wapta. Farther to the right may be seen a section of Emerald Glacier and some of the peaks of the President Range beyond. 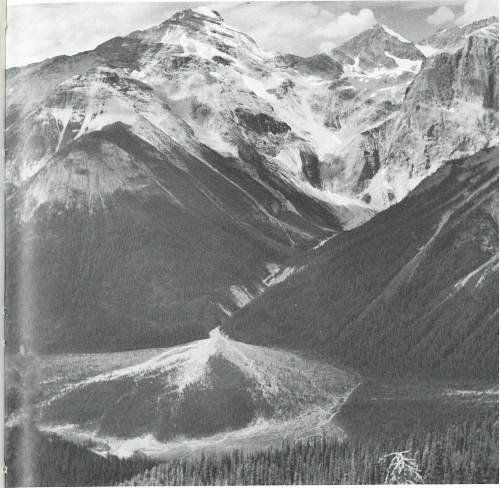 The steep-walled inner valley of Yoho River shows a general U-shape, indicating that at one time it was occupied by masses of glacial ice. The highway here goes through a long rock-cut that exposes hundreds of feet of the layered sedimentary rock forming the mountains. Small breaks or faults can be seen in several places, as can jointing and the layering in the rocks themselves. Farther to the west are the reddish peaks of the Van Horne Range, framed in the valley of Kicking Horse River. Enormous stresses within the earth sometimes break and fracture the rock. Here is a place, on the south side of the main highway near the railway-tunnel lookout, where one of these fractures or breaks is very clearly shown in the actual fracture itself and in the bent rocks on either side. Park your car (where it is permissible) and walk to the upper end of the highway bridge over Kicking Horse River. Spread out below, the beautifully braided valley flat of Kicking Horse River shows how enormous quantities of debris have been fed into the waters of the river and spewed over the valley bottom. High above us to the south, the beautiful Cathedral Crags are cut into nearly flat lying sedimentary rocks. The same layering in any one peak can be clearly seen in the others, so it is apparent that the crags have been cut from what at one time were continuous and more extensive layered rocks. 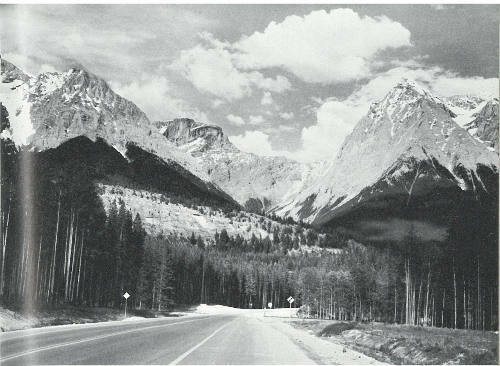 The north flank of Mount Stephen, above and to our left as we face westward on the highway, is pierced with small tunnels which mark the site of the old Monarch Mine (see page 69). Notice the snowsheds built along here to protect the railway from winter snow-slides and occasional rock-falls. Away to the west, some 11 miles away, the skyline is broken by the spiky peaks of the Van Horne Range, the chief ones being Mount King to the left and Mount Deville to the right. As we face the valley of Yoho River, the right or east side is dominated by Mount Ogden with its dipping sedimentary beds in greys and browns. Its flanks are marked with rock- and snow-slides and scarred by gulches that show as lighter-coloured features among the darker woods and rocks. The rivers from Yoho Valley and the valley of Wapta Lake unite just above this point and then pour their pale grey-green  silty waters onto the valley flats below. Lovely turquoise colours appear in pools and backwaters of the river where the coarsest silts and sediments have settled out. As we look westward, the bulk of Mount Field looms. Quite low down in its mass the dipping sedimentary formations are pierced by the dark holes of the old Kicking Horse Mine (see page 69), now indicated by little more than the ends of unused tunnels and the waste heaps lying below them. The spectacular plume of Takakkaw Falls draws the attention above all other features at this spot. Takakkaw Creek rises high on the plateau above, from the melting ice of Daly Glacier. It tumbles in a series of waterfalls until it comes to the edge of the great cliff leading nearly straight downward to the bottom of the main valley itself. This cliff was carved by glaciers when they occupied the whole of this valley. Their movement changed the more gently sloping V-shape of the river valley into a steep-walled, flat-bottomed U-shape. This left the small depression, which Takakkaw Creek now follows, high and dry on the side of the steepened main valley (see page 53). It is interesting to note how the water breaks into individual droplets as it falls through the air below the crest of the falls, until at the bottom the water is only a mass of heavy spray which moves back and forth at the whim of the winds. In a short distance, however, the water trickles among the boulders of the talus slope at the foot of the cliff and gathers together once again to form the rushing creek which finally joins the main Yoho River near the foot bridge and parking place. The campsite just beyond the falls is interesting in another way, for it is situated on part of an ‘alluvial fan’ made by a stream of meltwater coming off Emerald Glacier on the west side of the valley. In times of abnormally high water, enormous masses of rock rubble, fine sand and even mud pour down off the steep slopes and spread out over this flat area. At various times the stream will flow in different channels as the rocky debris fills hollows here and is scooped out there. At this spot the U-shaped cross-section of the main Yoho River valley is very evident. A view straight northwestward up Yoho Valley from here shows the white mass of Yoho Glacier at the head of the valley and parts of other glaciers on the flanks. Directly opposite and across the bridge over Kicking Horse River lies the townsite of Field where the park headquarters, the Royal Canadian Mounted Police office, post office and other facilities are located. You may note that it is built on a fan-shaped area formed by the delta of the small brook that rushes down the mountainsides between Mount Stephen on the left and Mount Dennis farther to the right. Fallen material from talus slopes and scree have been added to its back edge. Sunlight, filtered through the tall spruce trees, shines on the spray of Laughing Falls. This is on the west side of the main Yoho Valley, not far from Twin Falls. Small streams pour over the steep sides of this vast U-shaped valley at several places. The whole of Mount Stephen is made of lower and middle Cambrian shales and limestones with some quartzites in the base. As you look at it here you may notice that a sharp boundary separates regularly bedded and nearly flat lying beds which make up most of its mass, including its top, from a zone of rocks of more complicated structure to the west or right. A large fault zone, traceable for more than 20 miles, passes through this side of the mountain and can be clearly seen in the folded and faulted zone between Mount Stephen and Mount Dennis. One of the interesting side effects of this fault and its many subsidiary breaks is that a small block of strata containing many fossils was dropped down into the surrounding rocks. 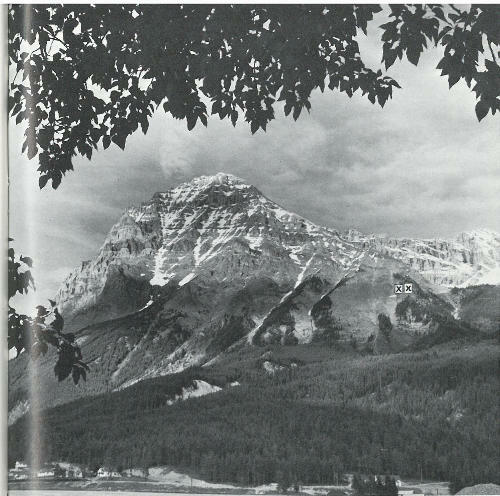 In this way the fossil-rich block has been protected from complete erosion—a fortunate happening, for many of the fossils are not known elsewhere (see page 35) and the rock formation itself is only known in another small, similarly preserved patch on the shoulder between Mount Field and Mount Wapta. The fossil locality can be seen from this stop; the photograph on page 37 will help you to spot it on the hillside. Away to southeast, down the valley of Kicking Horse River, one can see the reddish rocks of the shoulder of Mount King, as well as a small bit of the northwestern end of the Ottertail Mountains in the flank of Mount Hurd. Turning your back to Field you can see the twisted and broken rocks  of Mount Burgess rising steeply before you and the bulk of Mount Field to the right or northeast. Farther to the right beyond the largely invisible valley of Yoho River the peaks of Ogden, Paget and Bosworth notch the skyline, which ends where we began, on the flanks and peak of Mount Stephen. Field intersection to junction with Emerald Lake Road—1.8 miles. 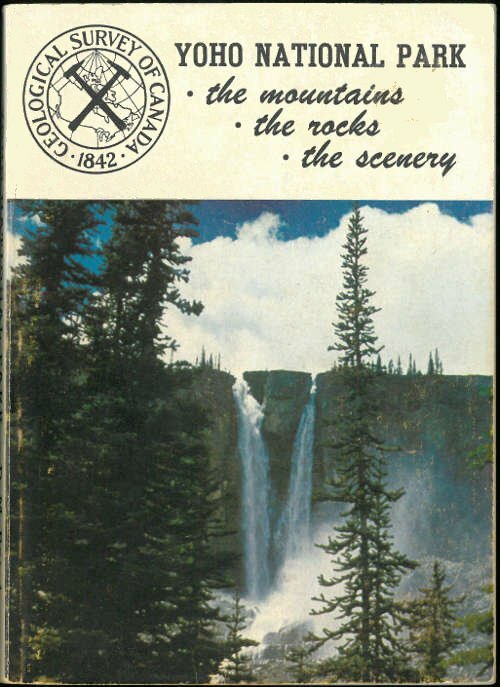 The origin of the Natural Bridge has been described in some detail on page 48. There we saw how a former waterfall was converted to the present ‘bridge’ by undercutting along a joint face, continued solution and the wearing away of a hole large enough to take all of the waters of Kicking Horse River. It is interesting to note the distribution of sandbars and swift currents in the river at this place. Above and below the Natural Bridge the river is precipitating sand and gravel at spots where the current is slowed a little because it is on the inside of a curve or in a backwater behind a projecting rock. If you sit down beside one of these quieter places and look carefully at the water moving gently by, you will be able to see the individual pieces of silty sediment suspended in it. A short walk from here—and one that is well worth while—takes you down the old main highway leading to the west, as far as the bridge over Amiskwi River which flows in from the northwest. Right at hand the swift-flowing river and the woods made a beautiful scene indeed. Looming in the east is the snow-covered top of Mount Stephen, conspicuously layered in a horizontal and castellated manner. To the right and much closer is the bare mass of Mount Dennis. Off to the west the reddish hills of the Van Horne Ranges are capped by Mount King and Mount Deville. This spot in the valley of Kicking Horse River is comparatively flat, for it is built on deep glacial deposits that were dumped in this area when the glaciers were melting. 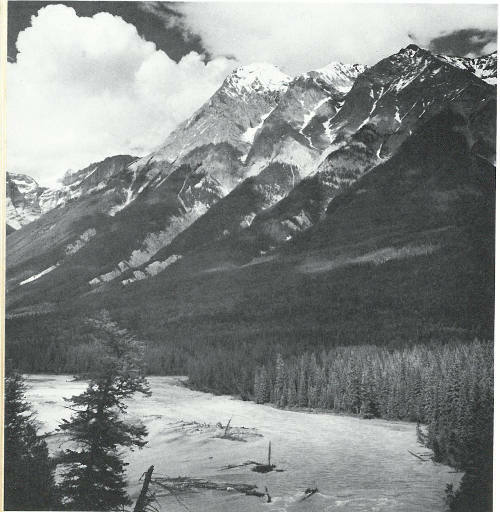 For the next several miles downstream, Kicking Horse River behaves entirely differently from the way you saw it near the Natural Bridge; instead of tumbling precipitously over a rocky bed, it now flows gently on a flat surface of gravels, sands and silts—some recently deposited by the river itself. This very beautiful spot is the result of glacial damming of a bowl-shaped depression now filled with water (see page 59). To the southeast is the great jagged mass of Mount Burgess, with long scree slopes marking where the waste of many hundreds of years has accumulated at the foot of the cliffs. Forming the skyline to the east is Mount  Wapta with its horizontal layering. On its right flank, about half-way to Mount Field, lies the famous fossil locality (see page 35). To the left of Mount Wapta is Yoho Pass; a trail through here leads from Emerald Lake to Yoho River valley at Takakkaw Falls. As we swing our view to the left or northward from Yoho Pass we see the steep-sided mountains of the President Range. The dominant peak, directly down the length of Emerald Lake, is Michael Peak. Between where we stand and Michael Peak a great bowl-shaped depression has been carved by the glaciers. Out of this flows a small, swift-moving stream carrying a vast quantity of sand and gravel which has been built into a considerable delta on the slightly flatter valley bottom beyond the north end of Emerald Lake. To our left as we look down Emerald Lake, Emerald Peak can be seen—a generally grey and brown structure composed of a series of rocks a little different from those of the rest of the mountains around us. From this point, Emerald Peak hides the very beautiful Mount Carnarvon, one of the few real matterhorn peaks in this part of the Rockies. Driving back along Emerald Lake Road you may catch occasional glimpses of the full President Range with the stately spire of Mount Carnarvon to the north, and, way off to the southwest, the reddish hills of the Van Horne Mountains and Mount King. By the time we are nearly back to the Natural Bridge turnoff, a wonderful sight to the southward includes the steep northeastern wall of the Ottertail Range, from Mount Vaux on down to the steep-walled towers of Mount Goodsir. Park your car and climb the bank of glacial debris on the southeastern side of the highway—that is, on the side of the road opposite the fenced-in service area. From here we can see the sweep of the valley below with the superb matterhorn spike of Mount Carnarvon culminating the southern end of the President Range. This great spike, carved in limestones of middle Cambrian age, shows what happens when glacial erosion cuts into a peak from several sides but is stopped just before the mass is completely reduced. The rest of the President Range can be seen beyond and to the right of Mount Carnarvon. The east side of the Van Horne Range, to the left or west, is noteworthy for the reddish-weathering Chancellor Formation, exposed widely on its slopes. Erosion by running water and the action of rock- and snow-slides have scarred the slopes with gullies and rocky valleys which extend well down into the timber. Back of us, or to the southeast, the heavily wooded valley of Ottertail River stretches ten miles or so to the boundary of Yoho Park and beyond into Kootenay Park. The great wall of limestones, with the Ottertail Formation being very prominent among the cliff-makers, extends from Mount Hurd southeastward beyond the Goodsirs and into Kootenay Park along the eastern front of the Ottertail Range. The three peaks of Mount Goodsir form a spectacular backdrop to Goodsir Creek as it rushes northward to join Ottertail River. The South Tower on the left rises to a height of 11,686 feet above sea-level—the highest point in Yoho National Park. Note the open strips in the woods on the slopes to the right. These are made in late winter and spring by snow-slides which clear out the larger trees. They are covered by bright green shrubbery and grasses in the summer. The milky water of Goodsir Creek, derived from the melting glaciers on the flanks of the Goodsirs, is full of rock flour which has been ground from the surrounding slopes by the moving ice. Waters from melting snows gather in Lake O’Hara to reflect the peaks all around. From here they flow northward, back and out of this picture, through Cataract Brook to join Kicking Horse River and then the Columbia River, eventually reaching the Pacific Ocean thousands of miles from their source. Note the steep rock walls and part of a bowl-shaped cirque to the upper right of this picture. Very high banks of glacial outwash line the road in the vicinity of the main bridge over Ottertail River. A great mixture of boulders, cobbles, fine sand and clay from the Ottertail River valley to the southeast and the main Kicking Horse River valley to the north, are all mixed up here. The spike of Mount Carnavon dominates the scene to the north. Directly opposite us and leading to the northwest is the valley of Otterhead River which rises in the snow-covered peaks far in the distance, A little to the right the valley of the Amiskwi, a much larger river, comes in across the heavily wooded valley. To the westward the sharp peak of Mount King tops the irregular skyline of the reddish-weathering Van Horne Mountains; southward, a bit of the spur of Mount Hurd sticks out. A large fault which separates the mountain groups on either side is thought to pass through this locality. On your map you may notice the way the rushing Otterhead River turns abruptly south just below this point for several miles before joining it. This stopping point offers a good all-round picture of the mountains in the central part of Yoho National Park. Off  to the southwest the line of the Beaverfoot Range forms the skyline well south of the park boundary. Mount King towers directly opposite us to the west, across Kicking Horse River. Almost due north are the snow-covered mountains of the President Range with Michael Peak to the far right and the spike of Mount Carnarvon pointing sharply into the sky. It is in the deeply wooded bowl to the right of this mountain mass that Emerald Lake lies. On the valley flat below, Kicking Horse River wanders about on deposits of glacial debris and sedimentary accumulations of its own making. Across the valley you can see how streams have cut deep gullies into the flanks of Mount King and the end of the Van Horne Range. This lovely little picnic area is on a small projection into Kicking Horse River and is notable for the many different kinds of water one can observe here. 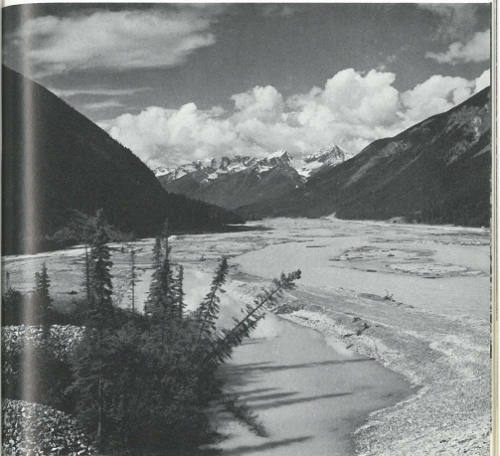 In summer the main thread or stream of Kicking Horse River is very heavily laden with silt and finely ground rocks derived from the grinding glaciers in its distant headwaters. In the quieter parts of the river where the current is not as swift—for example in front of the small beach at this picnic area—the water is different in that the coarser particles have settled out. This makes a considerable change in the appearance of the water, and in some of the very quiet backwaters of Kicking Horse River you can see that it is a clear turquoise colour. Finn Creek itself is interesting in this respect for its clear blue  water pours into the silty grey of the Kicking Horse River at this picnic area. Without knowing anything about Finn Creek one might surmise that it does not come from glacial meltwaters but comes instead from the accumulating drainage of the mountains to the back, for glacial waters are always silt-laden. If you look at the bottom of Finn Creek you may note that it follows an artificial channel made to control the flow of the stream. The slabs in the creek bottom are all in a shingle-like arrangement. This kind of thing commonly happens naturally in streams that are full of flat, slab-like pebbles and boulders, and the explanation for it is simple. Consider what the current would do to a slab of rock that is pointing upstream or against the current. The moving water would get under the projecting upstream edge and flip the boulder over, presenting its long slope to the current. In naturally shingled or ‘imbricated’ stream-bottoms the perfection of the arrangement is often quite astonishing. The same feature may often be observed on beaches, but there the shingling or imbrication is arranged in the opposite direction; the infalling waves make the swiftest currents and these overturn the boulders so that their long slopes face the water. A reddish mountain peak of the Van Horne Range shows above the woods to the northwest across Kicking Horse River. Its colour indicates that it is cut into the rocks of the Chancellor Formation. A great mass of bedded grey and brown rock that looms craggily above and to the east is part of Mount Hurd. For some distance on either side of the turnoff from the main highway to this picnic spot, banks of glacial debris are exhibited along both sides of the highway. They exhibit the customary mixture of fine and coarse rocks of a variety of kinds. The boulders are commonly faceted and smoothed, having been made this way by the movement of the glaciers as they were forced over the rocky surface beneath the moving ice at a time when the glaciers covered this part of the valley. Walls of fresh rock line the highway around the big bend about 4 miles north of Leanchoil. The rocks vary from massive to thin-bedded and from unaltered to heavily sheared and broken. Some joints and small slips or breaks cut even the least-broken rocks. In addition to the rocks themselves we may observe that on the southwest wall the ragged, irregular, freshly broken appearance of the rock-cut is interrupted by some smooth, gently curved surfaces. From the general shape of these walls, it appears that the road-builders have cut through a number of old ‘potholes’ (see page 68) or possibly a section of an old river channel. Potholes are cut in river bottoms where currents move boulders and pebbles around and around in corners and irregular pockets, causing the hard boulders to eventually wear holes by simple abrasion. If this goes on long enough, very deep round holes may be produced. Some rocks are more susceptible to this kind of pothole-cutting than others, and currents and other conditions in the stream may also vary from place to place. For these reasons potholes usually occur together in clusters. In this road-cut it seems that at least two very large potholes have been encountered during the course of the blasting operations. Still preserved at the northern or right end of the pothole section as you face it, is a small pocket of the rounded boulders and gravel which took part in the cutting of this canyon or series of potholes. The very round shapes of the boulders suggest that they have been much worn in running water. It is interesting to note further that the smooth sides of these old potholes or channel surfaces afford by far the best place to observe the bedding in the rocks themselves. In one rock wall particularly (see the figure on page 67 for a general view and the one on page 94 for a close-up of the bedding), a great deal of detailed information about the bedding is visible in these smooth walls. The thin layers of dark rock are neither flat nor continuous in all places. In the bottom part of the rock wall the bedding seems to be regular and undisturbed, but about 3 feet upward from ground level it seems to be fairly deeply wrinkled. A short way above that again the beds seem to be somewhat broken and discontinuous. In some places it looks as though the disturbance that wrinkled the bedding took place at a time when the most severely disturbed beds were at the surface of the accumulating sediments at the bottom of the sea. This is suggested because the wrinkling affects particular layers profoundly, yet does not affect the layers a short distance below them. Further, the layers just above the wrinkled ones appear to have been laid down on top of an already corrugated surface. Four or five feet above the most wrinkled layer the beds are again quite flat and undisturbed. Except for a very small patch, all the rocks of Yoho National Park are of sedimentary origin, having at one time accumulated on the bottoms of shallow inland seas as muds and sands. The rock which finally resulted is layered because the sedimentary materials came down at different times with slightly different compositions. At this spot, at the big bend of the main highway about 3 miles north of Leanchoil, the fine layering in the sedimentary rocks is very clearly visible. 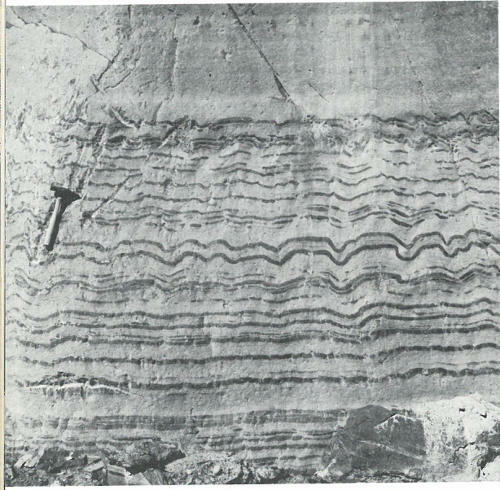 It seems likely that some small disturbance of the soft sediments took place before the whole sequence was made into solid rock, because, as you can see, the wrinkling appears to be confined to some layers without affecting the ones above and below. Note too the way the running water has cut into some parts of the rock wall a little more deeply than others, so that the round surface of the old pothole is not cylindrical but instead is irregular in vertical profile. This is probably due to differences of hardness and perhaps slight differences in solubility of the individual layers of rock. This viewpoint overlooks a fast-flowing section of Kicking Horse River and presents the mountains all around. The bottom of the valley has narrowed at this point but it is floored with sand, silt and gravel partly brought in by the river itself and partly by the glaciers that once filled this valley, so that the river is overloaded with debris. The result is that at ordinary water levels the river channel has several very low streamlined islands, which are made of the river’s own deposits. From here we can see the valley of Kicking Horse River swinging away off to the northward and we can look almost directly up the valley of Porcupine Creek which is opposite us and trends northwest. In some places the mountains on the eastern and northeastern sides of Porcupine Creek are strongly coloured in reddish brown. This is because they are  cut into sheared rocks of the Chancellor Formation—rocks that seem to contain a considerable quantity of iron which oxidizes or rusts when the rocks weather at the surface. Southward, straight down the valley of Kicking Horse River, the skyline is made by mountains of the Beaverfoot Range which lie south of the boundary of Yoho National Park. Dominating the view across the main road are the tall peaks of the Mount Vaux-Chancellor Peak complex. The rock-cut in the main road itself is in sheared rocks of the Chancellor Formation. Small areas of heavily scratched and smooth rock are visible along the edges of the cut where the gravels and cover have been stripped off during the course of road-building. These are places where glaciers scratched or striated the surfaces as they moved ponderously over the area long ago. Boulders and rocks frozen into the bottom of the glaciers scratched the surface of the solid rock beneath. The scratches have been preserved under the cover of glacial debris that has remained there since the glaciers melted. These scratches or striations may be observed at several places on both sides of the road, close to the edges of the fresh rock-cut. Grey to black limestone filled with scams of white calcite has been quarried at this spot to supply crushed rock for much of the road construction in Yoho National Park. From very near here a trail leads a couple of miles southward to Wapta Falls (see page 50). The Warden’s station at Leanchoil nestles in the deep woods below the valley of Hoodoo Creek. The mass of Mount Vaux rises on the left and part of Mount Ennis forms the back of the head of Hoodoo Creek. 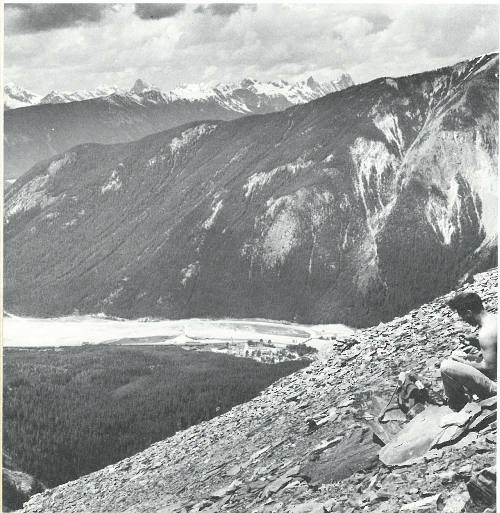 From this quarry the whole row of mountains from Mount Vaux southward to Clawson Peak appears as a great wall on the far side of the through-going valley which includes parts of Kicking Horse River and its tributary, Beaverfoot River. All along the front of this mountain mass, forested shoulders separate steep-walled rocky gullies which are generally below steep clefts in the bare rocks above timberline. The principal mass at the far left is Mount Vaux. On its sides and on Chancellor Peak—the high sharp mountain to the right of the gap—some very long scree slopes represent centuries of accumulated frost-wedged and snow-slid boulders. From this distance it is easy to see that some of these slopes are fan-shaped and that their angle of steepness is the natural angle at which this material first came to rest (see page 22). In some of the scree slopes the coarser and larger boulders have rolled to the bottom, leaving the finer material at the tops of the fans. In one gully on Mount Vaux the stream of rock waste continues far down the mountainside to form a slow-moving ‘rock glacier’. The peak of Mount Vaux on the left and Chancellor Peak on the right, with part of the mass of Mount Ennis at the back, make a great bowl-shaped depression in the hills. Out of this flows Hoodoo Creek. From this place one can just see some of the eroded gravels along the high sides of the steep valley of Hoodoo Creek where the world-famous Hoodoos of Leanchoil are located (see page 44). This view is straight into the glacially carved bowl between Chancellor Peak on the right and Mount Vaux and its various shoulders on the left. The low ridge just beyond the bend in the road is a spur of the Van Horne Range. It is made of highly sheared rocks that have been much altered along a great fault zone. This fault extends for many miles along the valley now occupied by Beaverfoot River in the extreme southern corner of the park and Kicking Horse River to the northwest. 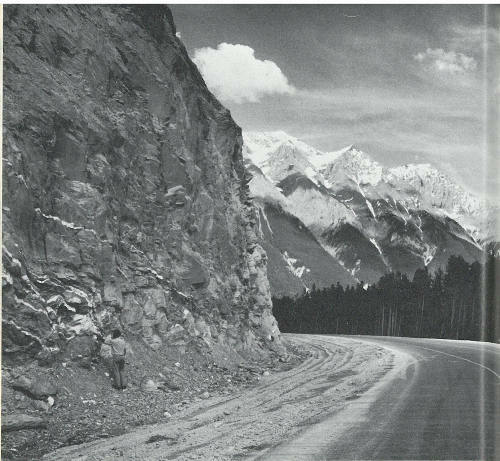 This section of the Trans-Canada Highway follows a part of the valley of Kicking Horse River which is cut into a very heavily sheared zone, known as ‘the White River fault’. The rocks have been changed from their original sedimentary nature to very fine grained talcy slates which are broken and smashed along many joints and slip planes. 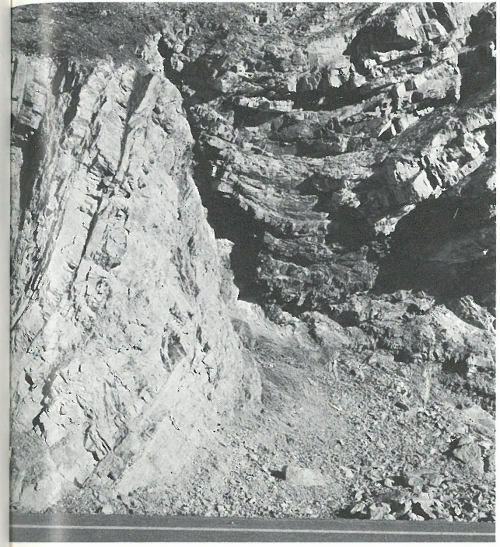 Veins and masses of white quartz cut the sheared rocks irregularly in many places in the cliff, as illustrated in the photograph on page 100. The main highway crosses Yoho National Park from its East Gate in a long, gently bending arc to Leanchoil where it swings rather abruptly to the northwest. This rock-cut, at the bend where the road changes direction, exposes very highly altered and broken rocks of the Chancellor Formation. The same sheared and changed rocks occur all along the road to the West Gate, and seem to mark a giant fault system where the earth has actually been fractured and broken. As a result of movements and shearing along this fault system, the rocks no longer resemble the original sediments from which they came. Masses of white quartz vein the rock. To the east the great mass of Chancellor Peak juts into the sky and the accompanying peaks extend in a line to the southeastward. The main highway leading through the park and westward to the valley of Columbia River lies in a more or less open valley between the Beaverfoot Range to the south and a spur of the Van Horne Range to the north. At this point Kicking Horse River has turned from its ancestral valley, which leads to the southeast from Leanchoil, into a northwestward course. In this new route it has cut a very deep canyon in its headlong tumble to the valley of Columbia River a few miles beyond and a thousand feet below. The rocks in the buildings and entrance-way at the West Gate do not come from Yoho National Park but from the Mount Rundle area of Banff National Park many miles to the east. The fill along the shoulders of the highway in this section is composed of rounded boulders and pebbles. Because  rounding of this kind is only produced in water-worn gravels we know at once that this material did not come from the road-cuts or rock quarries nearby but from a deposit of gravel that was laid down by a river. Further evidence of this source is the diversity of types of rocks in the gravel. Whether you drive along the highway through Yoho National Park, or pass through it on the train, you cannot but be impressed by the magnificent scenery that surrounds you. This sense of beauty can only be deepened by a knowledge of the long geological history behind each part of the landscape. Lofty mountains covered with snow and ice now stand where the waves of ancient seas once moved in rhythmic procession. Valleys now filled with beautiful forests and rippling streams were once occupied by great glaciers that ground slowly forward, pushing all before them. Steep-walled chasms now echo the sounds of falling water of streams which once flowed at higher levels but have slowly cut their way down through the solid rocks. Lakes that now sparkle in the summer sun lie in bowls carved long ago by moving ice. We are fortunate indeed that large areas of this beautiful country have been set aside for the enjoyment of all who come their way. For more information on the geology of Yoho National Park see the following publications. 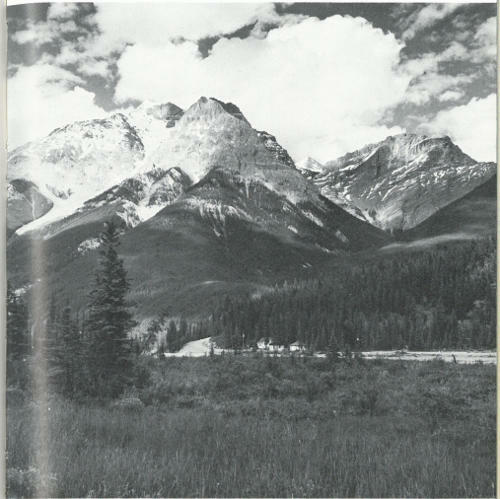 Alberta Society of Petroleum Geologists—Guidebook for the Fourth Annual Field Conference; Banff—Golden—Radium, 1954. A professional approach to the geology of a large area of country, including Yoho National Park. This book includes general articles on the history of the area, the details of the geology, and roadlogs for certain highways. Available from the Alberta Society of Petroleum Geologists, 631 8th Ave. W, Calgary, Alberta. Geology and Economic Minerals of Canada. Economic Geology Series No. 1 (1957) of the Geological Survey of Canada. This compilation of the geology of all of Canada contains a great deal of information on the western mountains. Available from the Queen’s Printer, Ottawa, or from the Geological Survey of Canada, Ottawa. Particular questions of a geological nature concerning Yoho National Park should be addressed to the Director, Geological Survey of Canada, Ottawa, or to the office of the Geological Survey in Calgary or Vancouver. For information on all other matters concerning the park, write to the Director, National Parks Branch, Department of Northern Affairs and National Resources, Ottawa. See this map at a higher resolution.